Dr. William A. ALLEN, one of the most prominent physicians of Greenville, was born in Jacksonville, Morgan Co., Ill., son of William and Mary (KILLINGSWORTH) ALLEN; he a farmer, born at Knoxville, Tenn., in 1799, and dying in Hillsboro, Ill., in 1862; she also a native of Knoxville, born in 1824, and still living; they were the parents of eleven children. Our subject, Dr. ALLEN, after his primary education was completed commenced the study of medicine, finishing the same at the St. Louis Medical College, from which institution he graduated, when he began the practice of his profession at Greenville, in 1855, where he has continued in active and successful practice. He has filled the positions of member of City Council of Greenville and member of the Board of Health, and served two years during the late war for the Union, as Assistant Surgeon of the Ninth Illinois Infantry. In 1860, he married Miss Millicent N. BLANCHARD, born in Greenville, daughter of Mr. L. BLANCHARD, of Stoughton, Mass., who came West about 1822; three children have been born to them - Victoria, Jessie and Ethel. He is a Congregationalist, a Mason, an A. O. U. W. and a Democrat. Lemuel ADAMS, Postmaster, Greenville, was born in Dayton, Montgomery Co., Ohio, in 1831, son of John and Mary (BACON) ADAMS, he born in Kentucky in 1802, by occupation a cooper, and dying in 1877; she, a native of Allegany county, N. Y., born in 1804, and died in Greenville, Ill, in 1877; they had six children. Our subject, after obtaining an education afforded by the common schools of Indiana and Illinois, learned the blacksmith's and wagon-maker's trades, and has chiefly followed those trades and merchandising until his appointment as Postmaster of Greenville, in the winter of 1881-82. In April, 1861, he entered the military service, and was elected Lieutenant of Company D, Twenty-Second Illinois Volunteer Infantry, and was wounded at the battle of Belmont, Mo., in November, 1861, coming home in 1862 on account of disability from wounds. In 1862, in Greenville, he married Miss Julia Ellen BIRGE, a native of Bond County, born in 1839, daughter of Ansel and Millicent (TWISS) BIRGE, both natives of Vermont, he born in 1788 and she in 1808. Three children have been born to Mr. ADAMS - Emma, Edgar and Cora Alice. Mrs. ADAMS died in 1874. May 4, 1882, he married Miss Anna MORRIS, of Milton, Ind. Mr. ADAMS came [Page 6] to Bond County in 1852. Is independent in his religious views; is a Mason, an Odd Fellow, and a Republican. George F. BERRY, merchant, Greenville, of the well-known general merchandising firm of BERRY & DAVIS, is a native of Bond County, and was born in 1844. His father, from whom our subject takes his name, was a farmer by occupation, and was born in Rockingham County, Va., A. D., 1819, moved to Christian Col., Ky., thence to Bond County in 1827. He took as his wife Miss Louise ENLOE, the fruits of this alliance being three sons and four daughters. He departed this life in 1867. George F., Jr., received his early education in the common schools of Bond County, and closed his studies with a special academic course. He received his first business experience as a salesman in a store and in 1869 established the business with which he is now connected. October 10, 1871, he married Miss Eliza J. HENRY, daughter of Judge A. G. HENRY, a prominent and successful politician and a pioneer of Bond County. 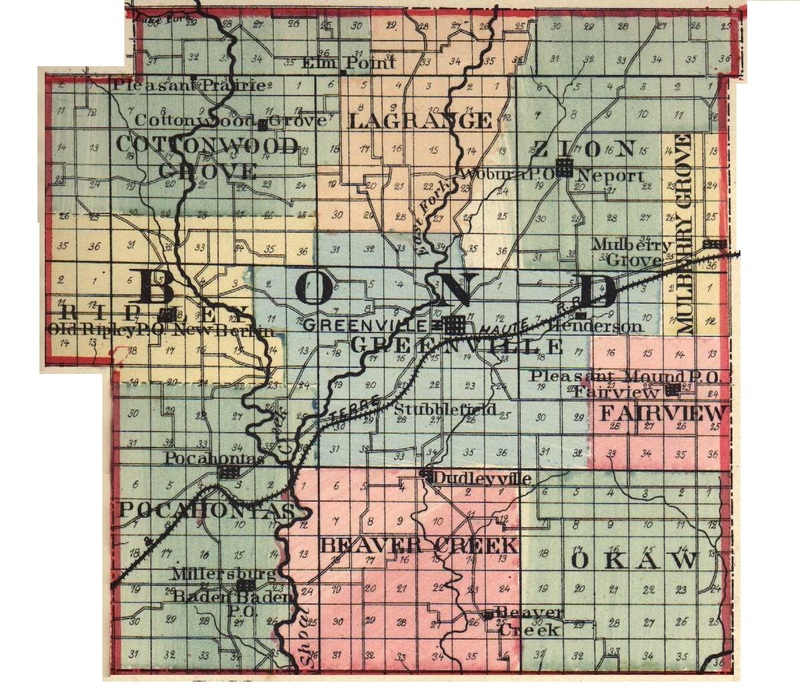 Mrs. BERRY was born in bond County in 1852. They have four children - Mary N., Nouisie, Ellen and Henry. Mr. BERRY is counted among the successful business men of Bond County, and has represented his [the Forty-second] district in the Thirtieth General Assembly of Illinois. He has also served one term as Clerk of the city of Greenville, is a member of the Christian Church, and of the Ancient Order of United Workmen. His grandfather, David BERRY, was a native of Delaware, born in 1767, removed when a young man to Rockingham County, Va., where he married. Here all but two of their eight children were born. In 1811, he removed to Christian County, Ky., where they resided until 1827, when he came with his family to Greenville, Bond County. Her he resided until his death, which occurred in September, A. D. 1842. But two of his children are now living. Henry BASS, Greenville. In a list of some of the most prominent agriculturists and self-made men of Bond County, the name of Henry BASS, of Greenville City, occupies a prominent place. He was born in Fayette County, Ill., April 22, 1833, and was the sixth child of the family of twelve children of Guilford and May Ann (PROCTOR) BASS, Guilford BASS was a native of North Carolina, and removed from there to Kentucky for a time, thence to Tennessee, thence to Fayett County in 1832, locating northeast of Vandalia about twelve miles. There he remained until his death, in 1845. His wife survived until 1872, when she also departed this life, leaving ten sons and two daughters to mourn her departure. But two of these, William and our subject, are now residents of Bond County. Henry left home at the age of fourteen. He came to Bond County, sought and found employment on a farm, receiving only $7 for a hard month's work, and saved sufficient means to make part payment on his first purchase of 100 acres of Bond County land, in Beaver Creek Precinct. In August, 1856, he made a second purchase of 100 acres, which he still owns, and to which he has since added, owning at one time 1,500 acres. Mr. BASS married Nancy GOODSON, daughter of Spencer GOODSON, a native of Kentucky, a farmer and blacksmith, and came to Illinois when a young man. With the exception of a four years' stay in Missouri, he has been a resident of Illinois, and now of Christian County. Mr. BASS is the sixth child. The have six sons and two daughters - William H., Abbie, George, Edward, Walter, Louis, Leoni and Leonard. Abbie is now Mrs. C. C. SQUIRES, of Beaver Creek Township. Mr. and Mrs. BASS are members of the Baptist Church of Smith Grove. Their home is in [Page 7] Beaver Creek Precinct, Town 4, Section 20, Guilford and Charles S. are deceased. Guilford died November 14, 1856, and Charles August 31, 1866, at one year and eighteen days old. C. R. BENNETT, one of the most prominent and successful drug merchants of Southern Illinois. Commenced business in Greenville, in the fall of 1861, at the corner of Second and Main streets, where he continued until the following February. He then removed to west side of public square, where he conducted a most successful business, and in 1869 purchased his present location, whereupon he erected a substantial brick block, fronting twenty-six feet on College avenue. This is one of the most substantial and attractive blocks in the city of Greenville, is two stories in height and has a roomy basement. The upper floor is occupied with business offices. The first floor and basement are stocked with a complete line of drugs, medicines, paints, oils and varnish, toilet goods, trusses, pocket books and porte-monnaies and pocket cutlery, tobacco, cigars and confectionery, etc. Mr BENNETT also carries a full line of sugars, teas, coffees, spices and fancy groceries. Mr. BENNETT is a native of Ohio, and was born at Xenia, Greene County. His father, Mr. E. BENNETT is a native of New Jersey, and a pioneer druggist of the Buckeye State, and C. R.'s marked success as a druggist is largely due to his early and life-long experience, as well as the fact that his goods are always bought and sold at prices made upon the cash basis. The stock of his establishment is always well selected and complete. Mr. BENNETT gives his personal and undivided attention to his business, and makes a point to supply all the demands of the trade, and the sales of the establishment are annually increasing. Williamson BARKER, a farmer and a native of Bond County, is very properly classed among the pioneers, having been born near Old Ripley March 5, 1835, although he has not continuously lived in the county since that time. He is distinguished in his vicinity as having driven an ox team more miles than any other man in the county. The feat of driving a yoke of horned animals from Illinois to San Francisco, Cal., is one worthy of record, especially when accomplished by a backwoods county lad, such as was Mr. BARKER in 1854. Williamson's father, Jordan BARKER, was a native of Randolph County, N. C., a farmer by occupation, and emigrated to Illinois in the year 1817, and located near Old Ripley, on a tract of 240 acres of land, a portion of which he entered. He was a fearless and aggressive pioneer, came to stay and did stay, developing a farm, taking part in all public enterprises for the advancement of civilization; was an under officer in the Black Hawk war, and took part in other minor Indian engagements. He raised a family of ten children, Williamson being the third and the only one now living. Williamson's mother was one Nancy PLANT, and a member of one of the early pioneer families of Bond County. Our subject received the educational advantage of county schools of Old Ripley, and at nineteen years of age took an overland journey to California, where he spent in all about twenty-four years of his life, making the trip three times. He there spent his time in gold mining with moderate results; returned to permanently remain in Greenville in 1878, and is now independently retired on a fertile farm of 274 acres near the city. Levi BORROR, farmer, P. O. Smithboro. The BORROR family came originally from Germany, and settled in Hardin County, Va. The father of our subject was Solomon who emigrated from Virginia to Franklin [Page 8] county, Ohio, about the close of the war of 1812; the family consisted of the grandparents of Levi. The names of the children were Absalom, Solomon, Jacob, Isaac, Christina, and Martin, all of whom settled near Columbus. Levi was born January 14, 1834, in Franklin County; is of the third generation of those who came to Ohio; his brothers and sisters were Elizabeth, Ichabod, William C. and Gilbert L. Elizabeth married Wesley TITUS, and resides in Litchfield, Montgomery County; Gilbert L., in Marshall County, Ind. ; William C., died in the army' Levi, came to Bond County February 28, 1868, and located in Town 5, Range 2, in Greenville Precinct, where he has since lived. His farm consists of 270 acres. He has been twice married, and had children by both wives, both now deceased. His first marriage was March 1, 1859, to Catharine C. _____ who bore him two children - William alone now living. His second wife was Elizabeth ROACH, born in Pickaway County, Ohio, daughter of Charles ROACH. Mr. BORROR had by last wife five children - Benjamin F., Walter W., Albert J., Mary P. and Marion R. Mr. BORROR is a member of the Baptist Church; his father of the Christian Church. Thomas M. BROWN, farmer, P. O. Pocahontas, was born in Belmont County, Ohio, April 12, 1828; son of Simon BROWN, born in Virginia in 1783, a millwright and farmer by occupation, who died in December, 1864; his wife, Martha (WILLIAMS) BROWN, dying in 1860. They were the parents of eleven children, six boys and five girls. Our subject has been engaged in farming all his life; has served as School Director eight years, also Road Supervisor. During the war, he served in Company F, One Hundred and Thirty-fifth Illinois Volunteer Infantry, Capt. MACADAMS. He owns 120 acres of excellent land, and is a Democrat and an Odd Fellow. In this county, November 5, 1849, he married Mary E. FILE, born September 13, 1828, daughter of George and Mary A. FILE, by which union there were born seven children - Lafayette, Emma M., Marcella, Samuel M., Mary M., Sylvester and Benjamin. Samuel M. BROWN, son of the above, Thomas M. BROWN, was born in Ripley Township January 24, 1857. He received his education in the schools of the county, and has followed farming his entire life. January 6, 1881, he married Frances R. DIXON, born in Greenville Township October 8, 1861, daughter of J. M. DIXON, a farmer, and one son has been born to them - Jesse M.; is a Democrat. L. S. BROOKS, P. O. Greenville, farmer and stock-raiser, is the owner and proprietor of "Prospect View" farm. He was born April 13, 1853, in Penfield, Monroe Co., N. W.; son of Garry BROOKS, who was born July 5, 1806, near Middletown in the State of Connecticut, and was married to Emma CHAUNCEY, the mother of L. S. She was a daughter of John and Amelia (GOODRIDGE) CHAUNCEY. The paternal grandsire of L. S. was Samuel BROOKS, a native of Scotland, who emigrated to the Eastern States prior to the year 1800. Garry BROOKS is a resident of Fairport, in Monroe County. In his early life, he was engaged in farming pursuits and became wealthy, and has since retired from active business life. He had but three children - Fannie L., L. S. and Emma J. Our subject had good school advantages, and was brought up to farming pursuits. Having heard glowing accounts of the West, and the beauties of the prairies of Illinois State, he resolved to cast his lot there, and in the spring of 1877 he came west to this county, and the year following purchased the farm he now owns, on which he has since built a large and handsome residence and two large barns, the residence being located on a [Page 9] beautiful eminence which overlooks the entire township. He has the best improved farm in Bond County, and is one of the young and progressive farmers of the township. His wife was Mary McMILLAN, daughter of James McMILLAN and Susan HARMON. This union has been crowned with four children - Chauncey G., Fannie F., Jesse L. and Emma S. He is a member of the Presbyterian Church. OTIS B. COLCORD, blooded stock raiser, Greenville. Mr. COLCORD is a native of Yarmouth, Me., and was born March 16, 1818. His father, Daniel COLCORD, was a native of Exeter, N. H., and by trade a potter. He had a family of five children, of whom our subject was the third. All of these are now living, and residents of Illinois. Otis B. received his schooling in the public schools of his native place, and came West in the year 1837 on a prospecting tour into Indiana. Returning East the following year, he repeated his journey as far as Bond County in the year 1839. The following eighteen years of his life he spent in the employ of the reaper and mower manufacturing company of D. M. OSBORNE & Co., of Auburn, N. Y., as their Western agent, with headquarters at St. Louis, and at the same time conducting a farm of his own, making a specialty of Mambrino stock. Among some of his finest specimens of horse flesh are Mambrino Athlete, Leno Mambrino, Lady Harris, Rockey, Lady Plant, Lady Cooper, Mambrino Queen, Grape Shot, Maid of the Mist, Marshal, et al. J. J. CLARKSON, merchant, Greenville, is a native of England, born in 1845; son of James and Elizabeth B. (DOUGLAS) CLARKSON, both natives of England, but she of Scotch descent, and at present residing at Alton, Ill. Our subject, in addition to the ordinary common school education, took a course at Jones' Commercial College, St. Louis, and began life as a farmer, but has been in the express business, and at present is merchandising. In Carlisle, Ill., in 1870, he married Elizabeth McDOWELL, of Scotch nativity. Mr. CLARKSON served his adopted country during the late war, as a member of the One Hundred and Thirty-third and One Hundred and Forty-fourth Illinois Volunteer Infantry. He is a Presbyterian, a member of the I. O. G. G., the A. O. U. W., the I. O. M. A. and is a Republican. Mr. CLARKSON is at the head of the well-known firm of J. J. CLARKSON & Co., who do an extensive business in their line. They carry a full line of hardware, and are agents for various agricultural implements, being one of the most reliable concerns in Southern Illinois. George DONNELL (deceased). Among those men whose personal history is inseparably interwoven with the pioneer history of Bond County, was the lamented George DONNELL. He was a man possessed of all the essential qualifications for a most successful pioneer, and came to Bond County at a time when men of his type were most needed. Of his forefathers, this much only can be said: They were of Scotch nativity, and at the time when religious persecution prevailed in Scotland, they fled to the North of Ireland. George DONNELL's grandfather, Thomas DONNELL, was constrained to leave Ireland because of the unsettled state of religious affairs there, and in 1731 came to America with seven brothers and two sisters, and settled near Philadelphia, Penn. Of his immediate family or personal life little is known, except that he lived to a good old age, and that a son of his, Maj. John DONNELL, emigrated to Guilford County, N. C., engaged in agriculture, and there raised a family of fifteen children. Maj. John DONNELL was an earnest and zealous advocate for the principles of free government, and fought nobly for the independ-[Page 10] ence of America in the Revolutionary struggle, where he gained his military title. He was twice married. First, to Hannah MEEKS, and by her had three daughters and two sons. For his second wife he took one Betsey DENNY, and by her had five daughters and five sons. George, our subject, being his father's eleventh child, or his mother's sixth. He was born in Guilford County, N. C., July 1, 1793. His parents were both Christian people, and early in life he imbibed the truths and teachings of the Holy Bible, and connected himself with the Presbyterian Church of Buffalo, N. C., where they for many years resided. May 30, 1815, he married Miss Anna McLEAN, also a native of Guilford County, and born June 18, 1795. Her father was Joseph McLEAN, a North Carolina pioneer who married one Peggy MABIN, and Anna was their sixth child, and the second youngest of the family. She grew to be a woman of great strength of character, possessing unfaltering energy, and has been to her chosen companion a most faithful wife, to her offspring a loving and devoted mother. This union was blessed with a family of thirteen children, namely, Joseph M., John D., Polly E., William N., James M., Betsey A., Thomas S., George W., Mary J., Robert L., Levi S., Henry C. and Emily R., all born in Bond County except the two first named. Three, Betsey A., Polly and James M., died in infancy. George W., Henry C. and James are in the West. Joseph M., William N., John D. (deceased), and Thomas S. (deceased), all settled on farms in Bond County. Robert, Mary and Levi are deceased, and Emily, the youngest, married Col. George C. McCORD, of Greenville. George DONNELL emigrated to Bond County in the year 1819, and first settled near the forks of Shoal Creek, where he lived for several years. He sold his property there and bought one quarter section of land about three miles northwest of Greenville. This land he improved, erected upon it good buildings, making for his family a comfortable home, and not infrequently the weary traveler a welcome stopping place. To his landed estate he from time to time added, so that as his children came of age he gave each a farm of 160 acres. To the education of his family he devoted no little time and means, and for a time took up his residence at Hillsboro that they might have the best of school advantages. As a religious man, Mr. DONNELL was always prominent. At once, when coming to Bond County, he identified himself with the people of God, and united with the Shoal Creek Presbyterian Church, the second of the order in Southern Illinois. He, with others, organized the first Sabbath school in Southern Illinois, and believed by many to be the first in the State. This school held sessions on Saturdays and Sundays, reading, writing and arithmetic being in the Saturday programmes. The advantages of this school were improved by whole pioneer families, who came from long distances to attend. Mr. DONNELL was one of the organizers of the Presbyterian Church of Greenville, and aided with much time and money in erecting their first church edifice in the city, in 1827. In March, 1828, he was elected and ordained a Ruling Elder, which office he filled with great fidelity until 1875. As he advanced in years he sold most of his farming lands, and afterward secured a comfortable home in Greenville, and from that time until his death lived a comparatively retired life, devoting much of his leisure time to social and religious duties. Mr. DONNELL was a man of positive traits of character, but realizing man's liability to err, he was always open to conviction, and anxious to repair an injury. Old age crept upon him, disease was found lurking in his system, and a stroke of paralysis in 1864 ensued. [Page 11] From this he gradually recovered. A second and more severe stroke, however, seized upon him, which resulted in his death Monday, April 16, 1877, at the residence of Col. George C. McCORD, surrounded by his children and friends, who lovingly administered to his every need. Mrs. Anna DONNELL, for more than sixty years his devoted wife, still survives him, and lives with her son-in-law, and youngest child, Ellen, Mr. and Mrs. McCORD. She is now over eight-even years of age, but still enjoys the use of her mental faculties, and more than average good health. A full page portrait of the late stalwart pioneer appears in this volume. W. S. DANN & CO. The mercantile house of W. S. DANN & Co. justly deserves notice in a history of Bond County, as standing at the head of the mercantile trade of Southern Illinois. The business was first established in 1870 by Mr. W. S. DANN and a brother, Mr. E. L. DANN, who opened a general stock in the corner number of the present establishment. Mr. E. L. DANN continued until 1875, when he retired, and W. S. DANN remained alone until Mr. F. P. JOY, the present junior partner and manager, became associated with him. The business increased so rapidly that more room was demanded. An adjoining lot was utilized, and the store enlarged and refitted, making it roomy and well lighted. It now has a frontage of fifty-one feet on College avenue, and extends fifty-seven feet on Second street, and comprises two floors and a basement. The basement is used for the storage of surplus stock, and second floor for display of carpets, mattings, etc., and winter stocks of ladies' cloaks and shawls. The first floor is the general salesroom. It has two double front entrances on College avenue, is conveniently arranged on the department plan, the stocks or different lines of goods being assorted and displayed in their respective departments. The stocks of these departments embrace complete lines of dry goods, including dress goods, silks and trimmings, embroideries, white goods, ladies' and gents' furnishing goods and notions, extensive line of boots and shoes of standard makes, hats and caps, and a fine assortment of staple and fancy groceries. The departments and stocks are presided over by Mr. JOY and his corps of seven efficient salesmen and one saleslady. Each clerk is an experienced stock-keeper, and is responsible for its condition. It must be in good order, every article or piece marked with price in plain figures. They also keep stock memoranda of goods to be purchased, and from time to time buy or order what the market demands, with the sanction or suggestions of the manager. Goods are all bought, marked and sold upon a cash basis, doing a general produce exchange business. The general clearing-out sales of unseasonable and remnant stock are a taking feature of the institution, and the entire establishment is conducted upon modern business principles. Business discipline, not so rigid as to become impracticable, is also a noticeable feature of the establishment. This house carries a stock of about $28,000, and does an annual business of nearly $100,000. Mr. W. S. DANN not being able to devote his personal time and attention to the business, spends much of his time abroad, and Mr. JOY assumes entire charge, and is always during business hours found at his store. William H. DAWDY, lawyer, was born in Shelby County, Ill., January 1, 1845; son of John H. and Nancy (FRAZIER) DAWDY, he a resident of Pana, Ill., a lawyer by profession, of twenty years' practice, and was formerly a merchant; has been Associate Judge of Christian County, and held other minor offices; is Police Magistrate of Pana; his wife is a native of Kentucky. They had two children, [Page 12] William H. being the oldest. Our subject attended the seminary at Shelbyville about five years, afterward at Walton Academy, Pana, and later at Eureka College, Illinois, one year. After leaving school he began the study of law with HENRY and ROSS, and was admitted to practice July 1, 1865. Located at Pana, two years, Vandalia, one year, and came to Greenville August 14, 1868, where he has remained since, having obtained a lucrative practice, and being regarded as one of the ablest and most successful lawyers of Bond County. He has held the position of City Attorney of Pana, City Attorney of Greenville, Justice of the Peace, and State's Attorney of Bond County from 1872 to 1880. July 7, 1872, in La Crosse County, Wis., he married Miss Amelia A. TRIPP, born in Trumbull County, Ohio; daughter of Almer TRIPP, a native of Vermont. One child has been born to Mr. DAWDY - Clarence A.; is a member of the Christian Church, of the Odd Fellows, Workingmen, Good Templars and the Democratic party. Michael V. DENNY, cashier in bank, Greenville, born August 31, 1833, in bond County, the only child now living of Samuel W. and Catharine (FINLEY) DENNY, he born in North Carolina in 1805, a farmer by occupation, and died in 1841. His wife was born in Tennessee in 1808, and is still living. Our subject received his education in the academy at Sullivan, Moultrie Co., Ill., where, in 1860, September 6, he married Margaret S. PERRYMAN, who was born in Shelbyville, Ill., April 26, 1838. Her parents were John and Ann S. PERRYMAN, he of North Carolina and she of Ireland. To Mr. and Mrs. DENNY was born a family, of whom three daughters are now living - Annie L., Katie M. and Lizzie S. Mr. DENNY was in the mercantile business ten years, bank cashier thirteen years, County Superintendent of Schools five years, Township Treasurer about ten years, and Treasurer of Greenville City for several terms. His politics, Democratic; his religion, Christian; is a member of the I. O. O. F. an A. O. U. W. His grandfather, James DENNY, came West with his family from North Carolina and located at McCord, now Cottonwood, where he was engaged in farming. Nathaniel DRESSOR, banker and farmer, P. O. Greenville, banker and farmer, P. O. Greenville, was born June 24, 1825, in the State of Maine; son of Rufus and Tamer DRESSOR, both natives of New England. His father emigrated to Bond County in October, 1837, and was there engaged in farming and milling. The subject was the fourth child of a family of five sons and two daughters; his education was received in the common schools; he was a very successful farmer and a shrewd financier, being President of the First National Bank of Greenville. He married Elizabeth S. McFARLAN, daughter of Robert McFARLAN, a farmer. They had five children - Alenia, now Mrs. John W. McCORD, of Milan, Ill.; Charlotte, deceased at the age of twenty-five, was an accomplished, thoroughly educated lady, being a graduate of McKendree College; Edwin, a farmer, near Greenville; Roxanna, deceased 1878; Julia, deceased 1880, was the wife of William A. NORTHCOTT, present State's Attorney of Bond County; and Winnie, now in school. Is a member of the old Republican party, and always a strong Union man. Edwin W. DRESSOR, farmer, P. O. Greenville, is the only son of Nathaniel DRESSOR. He was born in Cottonwood Grove, on the homestead farm, December 12, 1854; he was raised to farming and trading pursuits, and remained under the parental roof until his marriage, March 7, 1877, when he cast his lot in a matrimonial way with Mary M. KIRK -[Page 13] LAND, a native of Walshville Township, Montgomery County, this State; she was a daughter of T. C. KIRKLAND, one of the prominent farmers and business men of Montgomery County. Immediately after his marriage he located on the farm he now occupies, in this township, where he has since been engaged in farming and stock-trading, being one of the largest dealers of his age in the county. He has had two children born him; but one living - Edith Mabel, born Aug. 11, 1880. William M. EVANS was born in Bath County, Ky., March 12, 1819,; son of Thomas and Anna (MARTIN) EVANS, he a native of Kentucky, born in Bath County May 27, 1799, and died August 19, 1870; she, a native of Virginia, was born March 6, 1798, and died September 15, 1847; they had eleven children, all of whom lived to maturity, William M. being the eldest. Our subject came to Illinois in 1845, from Indiana, settling in Bureau County, and, in 1855, came to Greenville and commenced the cabinet business, in which he continued until the war broke out, when he sold his business, and in 1864, entered the 100-day service in the Union army, remaining four months. In 1856, Mr. EVANS was one of the prime movers in the organization of the Republican party in Bond County; was a delegate to the Convention in 1858, that nominated Abraham LINCOLN for Congress; in 1860, member of State Convention at Decatur, Ill., and went from there to Chicago to labor in the interest of Mr. LINCOLN; was a member of State Convention in 1862; in 1880, was a delegate to State Convention at Springfield; in 1876, he was elected to represent his (Forty-second) district in the Lower Branch of the General Assembly of the State. After leaving the army, he commenced merchandising, in which he continued until 1877. On August 11, 1840, Mr. EVANS married Miss Levica YOUNG, born in Virginia October 12, 1819; daughter of Charles YOUNG, who died in 1851, leaving two children. December 28, 1852, he married Mary C. HUBBARD, born in Bond County, Ill., January 12, 1822; daughter of Peter HUBBARD, of Hennepin, Putnam Co., Ill. His oldest son, Daniel B., is clerk in First National Bank, and his other son, Woodford P., is a farmer in Iowa. The father of Mr. EVANS moved to Iowa in 1854, where he died. Moses W. ELAM, farmer, P. O. Smithboro, is the third child born and eldest son of Moses ELAM, of Town 6, Range 2. Moses W. was born March 3, 1853, on the homestead near Mulberry Grove. He was brought up on the farm, and made his father's house his home until maturity. He was married when twenty years of age. His nuptials were celebrated December, 1873; his wife was Cypha MOREY, born in Knox County, Ohio, daughter of Lucius MOREY and Ruth Ann CUMSTON. Lucius was born 1828, in Knox County; son of David MOREY, a native of Vermont, who emigrated to Knox County, and there settled as a pioneer. Ruth Ann was born in Pennsylvania, daughter of Benjamin CUMSTON. Mrs. ELAM came to Fayette County with her parents in 1865. Her mother died in 1868, leaving two children - Mrs. ELAM, and Inez, who married Thomas, the brother of her husband. After Mr. ELAM's marriage, he removed to Fayette County, living there five years, then returned to this county, where they have since lived, locating on their farm in the fall of 1880. Said farm consists of 160 acres, on the northeast quarter of Section 5. He has three children - Wilbur, Rose and Daisey; he and wife are members of the Christian Church. Joel ELAM, manufacturer, Greenville, was born in North Carolina, December 9, 1817; son of Edward and Letitia (CHAFFEN) ELAM, he a native of Virginia and a black-[Page 14] smith by trade; they had a family of fifteen children, Joel being the youngest. Our subject, after receiving an ordinary education, learned the blacksmith's trade, in Greenville, and at present is engaged in that business and saw-milling with his sons, Thomas and John, under the firm name of ELAM & Sons. Mr. ELAM has been married four times; first in 1843, to Nancy CLAY, in Menard County, Ill.; she died the first year of her marriage; second, Sarah E. SMITH, in 1845, who died the same year, leaving one child - Charles Edward, now deceased; third, Sarah McCORMICK, of Greenville, she had two sons - William and Thomas; fourth, Sarah WHITE, of Greenville, who has three daughters and one son - Ellen, Sarah, Miriam and John. Mr. ELAM is a Presbyterian and Republican. George B. ENLOE, farmer, P. O. Greenville; born Aug. 7, 1848, on the homestead situated in Town 6, Range 2, where his father, Ezekiel ENLOE, settled and remained until his death. The mother of George B. was Charlotte WHITE, who was born in North Carolina, daughter of Richard WHITE. Eight children were born to Ezekiel ENLOE and wife. The eldest was Marshall, then in order of birth came Claybourne, Thomas, William Edward, Mary E., Benjamin and George B., who was the youngest one of the family. He married Susan E. FOSTER, a native of this State, daughter of William FOSTER. Four children, Johnnie, William, Della and Ezekiel, are the issue of this marriage. In 1873, he located on his farm, where he now resides, having about 120 acres, selected on the south half of Section 31. He has one brother, Edward, in this township, and William in Town 6, Range 3. Mary E. married D. H. KINGSBURY, and resides in Greenville. Mr. E. had three brothers in the late war. Charles W. FLOYD, farmer, P. O. Greenville, is a native of Kentucky, Todd County. He was born in 1822, and was a resident of his native State until 1833, when he came with his parents to Bond County. His father's name was John W., a Kentuckian by birth, and was a son of Charles FLOYD, of Old Virginia. John W. FLOYD married Betsy JOHNSON, a native of Indiana. To Mr. FLOYD was born a family of ten children, viz., Ella married P. G. VOWTER; Nancy became the wife of William HARLIN; Polly, Mrs. W. BLACKWELL, George; Jane, Mrs. D. P. HAGEE; Charles W.; William J.; Sarah, Mrs. W. D. HENRY; John S., and Thomas W., who was a physician. In February, 1844, he married Eliza HENRY, daughter of John HENRY, a Kentuckian. After his marriage, he located in the edge of Clinton County. In 1849, he entered land in this count, one mile east of Wisetown. Moving on the same, he began improving it. In 1852, he moved south to Texas, and purchased land in Grayson County, and engaged in farming and stock-raising, remaining here until 1866, when he located on the farm he now owns, on Section 33, Town 6, Range 3, in Greenville Precinct. He has a fine location, one of the best in the precinct; he is a good farmer and has been successful in his business; his wife died June 22, 1877; he has four children - Jane, the eldest, and is the wife of E. D. WALLACE; George A., Mary and Charles H. The father of our subject was for many years a member of the Methodist Episcopal Church; and served in the war of 1812, and died in 1846; and during his life was affiliated with the old Whig party. James F. FILE, farmer, P. O. Greenville, born in Bond County, Ill., March 5, 1850. He was the son of George and Mary (LYTTAKER) FILE, he a farmer and distiller, died in 1858, and she in bond County, Ill. Our subject received part of his education in New Douglas, Madison County, and part in Bond County, Ill., where, in 1870, [Page 15] January 6, he married Ella F. BOLTON, daughter of John and Sarah BOLTON, natives of Ohio. To Mr. and Mrs. FILE were born five children - Charles H., Louella B., Edwin N. (deceased), George J. P. and Alberta J. Mr. FILE has always been a farmer. He was School Director for three years; his political views are with the Democrats; he is also a member of the Masonic order. He is a young man, thirty-two years of age; he has an excellent farm, which, by his energy and industry, he has rendered very valuable. Dr. James GORDON, Greenville, for eighteen years a practicing physician of Bond County, is a native of Huntsville, Ala., and was born on the 17th of January, 1818. Is a son of Hugh GORDON and Mortha Jane, JAGERS, his wife. His father, a native of South Carolina, born in 1788, settled in Alabama in 1816, and though a slaveholder, was a Whig in politics, and advocated emancipation; he died December 3, 1851; his mother, also a native of South Carolina, was born in Chester District in 1798, died January 3, 1849. James received his early education in the common schools of his native place, and in boyhood imbibed those habits of industry that have characterized his busy life. He united with the Methodist Episcopal Church at an early age, and spent three years studying, with a view to entering the ministry, but his mind gradually inclined to the study of the science of medicine and he abandoned his purpose and entered the Memphis Medical College. After completing his studies, he entered upon the practice of his profession in Mississippi, and continued it there and in Arkansas until 1864, when he became a resident of Jamestown, Clinton Co., Ill. Practicing there till February, 18770, he removed to Greenville, where he has built up an extensive practice. In the spring of 1875, the Missouri Medical College conferred upon him the ad eundem degree. In early life, he became a member of the Masonic fraternity, and has advanced to the Royal Arch degree. Dr. GORDON has been twice married, first at Huntsville, Ala., December 22, 1835, to Miss Mary Ann SANDERSON, of Madison County, Ala., born September 22, 1819, daughter of James and Elizabeth (BELL) SANDERSON, the former born in 1789, died February 5, 1853, the latter born in Chester District, South Carolina, in 1793, died in 1862. She died in 1860, leaving twelve children - Mary E., Hugh D., James B., John H., William P., Jerry T., Sarah F., Martha J., Robert W., Rufus B and two others who died without names. He again married in the month of June, 1860, to Mary Jane MARSHALL, born in Johnson County, Ark., August 26, 1837, daughter of Joseph N. and Annis R. (NEELEY) MARSHALL, the former still living, born in Tennessee in 1800, the latter also born the same year, died January 6, 1858. By the second marriage he has had ten children. Of the twenty-two, ten are now living - Madison D., Margaret A., Ferdinand R., Katie L., Emma H., Hattie M., Thomas F., James M. and two to her who died without names. Five of this number are married and are parents of this thirty grandchildren; two of his children have died after having married. Dr. Madison D. is the only one now of age not married. Of his family, seven sons have become practicing physicians, and four of those now living, including Madison D., his present partner, are in active practice. Dr. GORDON is a Republican in politics, but does not take active part in political contests. He is independent in thought, social and genial in his manner and inflexible in purpose. He has attained success in his profession and life by close application and a strict adherence to principles of Justice. A. J. GULLICK, Sheriff of Bond County and insurance, Greenville, was born in Mad-[Page 16] ison County, Ill., October 27, 1827, son of Beniah and Elizabeth (GINGLIS) GULLICK, he a native of North Carolina, a wagon-maker by trade, now deceased; she of same State also deceased. They had five children, only two of whom are now living, our subject being the eldest. He was educated in the common schools of his native county, and for some years followed peddling, being so successful as to accumulate enough to purchase a farm. He came to Bond County in 1852, locating at Mulberry Grove. Mr. GULLICK was elected Sheriff of Bond County in 1872, and served three terms of two years each. In 1880, he was again elected to the shrievalty, and is now serving in that office, which he fills admirably, acceptably, and with a faithfulness to duty and the rights of his fellow citizens that will make his retirement from the position a matter of regret among all classes. September 20, 1857, he married Miss Eliza A. DUDLEY, daughter of Mr. Alfred DUDLEY, a pioneer and farmer of Bond County, and the following children have been born to them: Seward A., Mason E., Harris A., Ruda E., Nellie E., Walter A., Pearl D., and an infant son unnamed. Mr. GULLICK is a Freemason, an Odd Fellow, member of the A. O. U. W., and a Republican. Ulrich GAFFNER, farmer, P. O. Greenville. Of the representatives of this township, none are more deserving than the above gentleman, who has made himself what he is today all by honest industry and rigid economy. He was born in Switzerland, August 22, 1835; son of Ulrich, who was born in Canton Berne in 1804; his wife was Mary SMOCHER, daughter of John SMOCHER, a native of Switzerland. The father of our subject was a farmer, which vocation our subject was early taught in life, in company with his brothers, who are yet at home in Switzerland, and engaged in farming on their own possessions, except one of the brothers, Godfrey, who emigrated to this State in 1857, and is now a prominent farmer in Christian County, this State. Ulrich, having heard very favorable accounts of America, and the advantages afforded the laboring man here, which so far surpassed those at home, that he determined to emigrate to this country, which he did, arriving here in May, 1860. He began working out by the month and saving his earnings, until he acquired sufficient means to enable him to make a purchase of land on his own account. His farm consists of 133.5 acres; the greater portion he bought of J. H. KOONCE, situated on Section 31. He was married in 1864, to Sarah SAHNERT, born in Hesse-Darmstadt, daughter of Peter and Elizabeth (WYANDT) SAHNERT. To Mr. GAFFNER have been born five children - Lizzie A., William, Mollie A., Lois and Edward, who have crowned this union. Mr. GAFFNER is a man that has a high regard for right and justice, and has no desire to do injury to any one, but to live an honest and upright life, and he is a good citizen in the community. He is a member of the Lutheran Church, as well as a stanch, worth citizen of the community. Andrew G. HENRY, Greenville, County Judge of Bond County, and son of John and Betsey HENRY, was born February 28, 1824, near Paris, Bourbon Co., Ky. His parents removed to Illinois in 1827, and settled in the north part of Clinton County, where they resided a few years, and then removed to near Beaver Creek Post Office in Bond County, where they resided until Mr. HENRY reached his majority. He secured as good an education as the limited school facilities of the county at that time afforded, the studies consisting only of the common English branches. Securing such books as he could for study and general reading, he pursued his studies at [Page 17] home, working on the farm and at the carpenter's trade. In 1851, he was married to his present wife, Mary A. HULL, daughter of the late Benjamin HULL, of Bond County. In 1853, he began the study of law, and in 1854 he removed to Greenville, the county seat of Bond County, and was admitted to the practice of the law at the bar, and has practiced in Bond and adjoining counties ever since, confining himself largely to that department of law belonging to real estate. Upon the organization of the Republican party he warmly espoused its cause, and attended its first State convention, which met at Decatur, Ill., in 1860. He was a warm supporter of Abraham Lincoln for President, and after his inauguration as President, was an earnest supporter of all the war measures of the administration, and from that time has indorsed all the leading measures and the general policy of his party, taking an active part in all of its campaigns. In 1872, he was elected to the Lower House of the Legislature, and returned again in 1874, serving with marked ability and to the entire satisfaction of his constituents. In 1877, he was elected County Judge of Bond County, which office he now holds. Mr. HENRY was one of the originators of what is now the Vandalia Line Railroad, being a large subscriber to the stock of the first company, and through the efforts of himself and a few other prominent citizens of Greenville, Bond County is indebted for her first railroad. Mr. HENRY has held a place as Director in the company ever since its organization. Mr. HENRY's family consists of himself, wife and two daughters, one of whom is the wife of George F. BERRY, of Greenville; the other is still at home. Mr. HENRY is always benevolent, aiding every worthy cause, and is kind and courteous to all. Being a man of strong convictions of right, and earnest in maintaining them, he is a man with strong personal friends and followers, and as would necessarily follow. Occasionally he makes an enemy; but at home among his neighbors, and wherever he is known, no man stands higher than does the Hon. A. G. HENRY, the subject of this sketch. Charles Douglas HOILES, banker, Greenville, was born in Greenville, December 1, 1844, son of Charles and Elizabeth S. (MORSE) HOILES, he a native of New Jersey, born in 1819, and for many years a prominent and successful business man of Bond County; she a native of Lowell, Mass. ; they had two children - Charles D., our subject, and Stephen M. Mr. HOILES received his early education in Greenville, later at Mount Union, and still later at Shurtleff College, Upper Alton, Ill., but mostly at select school in Greenville, under Prof. S. W. MARSTON. He commenced his business life in the mercantile business with his father, which lasted five years, when they entered the banking business under the firm name of HOILES & Son. S. M. HOILES, the brother of our subject, was admitted to the firm in 18723, which changed to HOILES & Sons. The father retired from the business in 1881. Mr. C. D. HOILES was a member of the Twenty-eighth Official General Assembly of the State of Illinois in 1872; delegate to the National Democratic Convention at Baltimore, which nominated Horace GREELEY; twice a member of the Democratic Central Committee; once a member for the State at large; candidate for nomination before the Democratic Congressional Convention, to represent the Sixteenth Congressional District in the National Legislature. The convention held sessions for three days and adjourned without making a choice. He is now serving his second term as Mayor of the city of Greenville. He was first married to Miss Sarah F. WEIR daughter of Dr. John F. WEIR, of Edwardsville, Ill.; she died June 30, [Page 18] 1874, leaving one son, Charles W., and one daughter, Ione. He again married in June, 1876, Miss Juliette P. WHITE, daughter of Prof. John B. WHITE, long connected with the educational interests of Bond County. From this last marriage, have been born a son, Guy B., and a daughter, Anna L.
Stephen M. HOILES, banker, is a brother of the gentleman whose sketch appears above, and was also born in Greenville, on the 8th of April, 1853. He is a member (as stated above) of the banking house of HOILES & Sons, and like his brother, is one of the best business men of the county. December 20, 1871, he married Miss Welma C. STOUGHTENBERRY, daughter of Jacob S. TOUGHTENBERRY, deceased, who was a resident and capitalist of Madison County, Ill. They have three children - Stephen D., Clarence E. and Sarah Bell. Stephen M., like his brother, is a Democrat. T. S. HUBBARD, farmer, P. O. Greenville, was born March 9, 1815, in Madison County, this State, eldest son of Peter HUBBARD, a native of South Carolina, born February 23, 1782, and emigrated to Randolph county, this State, in 1809, remaining but a short time, when he removed to Madison County prior to the war of 1812, in which he participated. In March, 1817, he located in what is now Bond County, on Section 1, Town 5, Range 3, where he remained until his death, which occurred November 25, 1868, his wife preceded him to the grave in 1854. They raised a family of eight children - T. S., being the eldest that grew up, George W., Lewellyn B., Mary A., William C., Isom G., John T. and Margaret J. were the others in order of birth. The HUBBARD family are of Welsh ancestry, both the father, grand and great-grandfather of our subject bore the old Biblical name of Peter. The mother of T. S. was Martha, daughter of Thomas GILLHAM. Thomas S. was reared to farm labor, and was educated at the common schools of his neighborhood. He was but two years of age when he came to this county. In early manhood, he was appointed to teach his district school of this township, now No. 2, in the year 1848, by subscription, being the first teacher who taught there. He like mathematics, and learned surveying, which he put into practice for some time as Deputy Surveyor of the county. In this county, February 3, 1843, he married Anna E., daughter of Asa L. and Ann E. (WRIGHT) SAUNDERS. In 1841, he purchased land where he now resides, then raw and unimproved. After his marriage, located on the same, has since continued a constant resident, and is one of the stanch and substantial citizens of the county. Since 1843, he has been a consistent member of the Congregational Church, serving as Deacon and Trustee of the same much of the time. In business, he has been successful, having (before he divided out among his children) about 700 acres of land. In educational matters, he has taken an active part in his neighborhood. His children are Lewis S., Julian S., Harriet L., Henry A., George C., Alfred C. and Mary J. Julian S., in Kansas; George C., in Iowa; others are settled in this county. Henry HILL, farmer, P. O. Greenville, born May 29, 1814, in Seneca County, N. Y., the eldest son and third child born to Henry HILL, his father, who was born November 26, 1790, in one of the Eastern States. November 16, 1809, he married Abigail SHUTZ, who was born April 5, 1791. to them were born the following children, the old family Bible tells the following tale: Nancy M., born October 30, 1810; Sally, May 30, 1812; Henry, May 29, 1814; Theodosia, March 15, 1816; Rosana, April 29, 1818; Polly, August 1, 1820; Ruama, August 7, 1822; William, April 19, 1825; Melinda, November 2, 1827; Jonathan, July [Page 19] 10, 1830; Clarissa, November, 1832. The father died January 16, 1852, his wife April 17, 1844. When five years of age, our subject removed with his parents to Montgomery County, Ohio, remaining there until 1842, when they came to this State, locating in Madison County. In 1868, he came to Bond County, locating on the northwest quarter of Section 31; here he has since lived. He has 272 acres of land. He began poor, had nothing but his lands and a willing mind to battle with the times in which he was surrounded, yet by diligence and rigid economy, he has acquired a home and competence by hard labor and patient industry. March 11, 1849, he married Mrs. Nancy GLENN, born in this county, daughter of Daniel MOORE, who was born February 6, 1792, in Rutherford County, N. C., son of Philip MOORE, from Virginia; he (Philip) married Phebe ELAM, of North Carolina. Daniel MOORE married Jane STEWART, who was born in North Carolina, April 13, 1804, daughter of Robert STEWART and Jane TURNTINE. Robert was a son of Alexander STEWART, an Irishman by birth. Daniel MOORE and family came to Bond County in 1818, making first settlement on Section 19, Town 5, Range 2. Mr. HILL has had eleven children born to him, five living - Daniel, George, James, Lemuel and Samuel - Belle died September 18, 1881, aged twenty-two years. She married Smith LONG; by him had two Children - Charlie and Marion. G. W. HILL, retired, P. O. Greenville, was born in New Milford, Litchfield Co., Conn., on June 6, 1821. His father, Roswell HILL, born July 12, 1788, died October 16, 1844, also a native of New England, was a school teacher and emigrated West about 1827. His mother, Frances (BUCKINGHAM), born April 16, 1791, died January 27, 1864, was also a New Englander. They were the parents of six sons and two daughters, the subject being the third son. He got his education in a common school in Ross County, Ohio, and commenced life as an apprentice to William GILMORE, tailor, Ohio, at the age of fifteen. He moved to his county in 1840, and with the exception of eight months in 1844, when he lived in Hillsboro, Montgomery County, he has been a resident and business man in Greenville, and up to 1867 was a prominent and prosperous merchant. In Edwardsville, Madison Co., Ill., on August 25, 1847, he married Elizabeth Barnes PLANT, born October 28, 1828, in Pocahontas, Bond Co., Ill., daughter of Williamson and Martha (SUGG) PLANT, he born in Anson County, N. C., May 6, 1799, died May 12, 1833; she born in North Carolina, died November 21, 1834. Subject has gained his position as one of the most frugal, thrifty and just-minded citizens of Bond County, by pursuing a straightforward course, doing business on business principles and making most of his time and opportunities. W. McLin HUNTER, Greenville, was born in Bond County March 17, 1827; son of Joseph and Elizabeth (MABIN) HUNTER, he born in 1795 she in 1793, and both dying within one week of each other, in 1851. They were the parents of seven children, four boys and three girls. Our subject received a very limited education in the schools of his native county, and has always been a farmer. He has served as School Director and Road Supervisor, but has generally avoided politics and the search after office. November 28, 1850, in Zion Precinct, he married Nancy R. GLENN, born in Zion November 11, 1832, daughter of Alexander and Frances GLENN, and eleven children have gladdened his household. Joseph E., Alexander K., Robert M., John R., Francis E., Betsey A., Mary J., Sophia E., Susan E., Laura B. and Finis E. Mr. HUNTER and family are Cumberland Presbyterians, and he is a Democrat. The HUNTERs were among the [Page 20] earliest settlers of this section, and McLin HUNTER now lives upon and owns the old homestead property, consisting of 280 acres, in Section 24. Marshall HUNTER, farmer, P. O. Pocahontas, was born in Bond County March 1, 1820, son of Joseph and Elizabeth (MABIN) HUNTER, he born in Tennessee in 1795, a farmer, dying in 1851; she, a native of N. Carolina, and dying one week succeeding her husband, leaving seven children, four boys and three girls. Our subject received his education in the subscription schools of his native county, and began life as a farmer, in which occupation he has continued throughout his entire life. He has served as Road Supervisor several years, and is very highly esteemed as a man and a farmer. His farm comprises 244 1/2 acres of excellent land, which is under a high state of cultivation. In Zion Precinct, October 1, 1846, he married Miss Elizabeth M. GLENN, born July 25, 1826, a daughter of Alexander and Frances GLENN, and which union has resulted in seven children - Frances E., Armina, Emily J., Mary E., Sarah E., Joseph W. and Ida A. Mr. HUNTER is a member of the Cumberland Presbyterian Church and a Democrat. Solomon HARKEY, farmer, P. O. Greenville, was born July 28, 1852, in the northern part of Bond County, Ill.; son of William HARKEY, a farmer, who was born in North Carolina April 29, 1811, and came to Illinois at an early date. His mother, Nancy (THACKER) HARKEY, was born in Kentucky January 1, 1814. The subject is the youngest of a family of nine, eight of whom are still living. He received a common school education at La Grange Precinct. He followed farming about fifteen years; later, he went into the restaurant business at Hillsboro, Montgomery Co., Ill., and still later was in the grocery business. He was married February 19, 1871, in Bond County, to Caroline PRATER, daughter of John and Sallie (HUNT) PRATER. His wife dying, he again, December 9, 1874, married Laura WRIGHT, daughter of George W. and Emily (ABLE) WRIGHT. He had three children - William L., Hattie V. and Minnie A. The latter is by his second wife. He was a Republican in politics. E. P. JUSTICE, merchant, Greenville, one of the most prosperous business men of the thriving little city of Greenville, was born January 5, 1840, in Clinton County, Ill. His father, J. J. JUSTICE, a retired farmer of Carlisle, same county, is a native of Georgia; came to Illinois when about nine years of age. Of his four children, our subject is the only one now living. He lived on his father's farm in Clinton County most of his life previous to coming to Greenville. In November, 1876, he opened his present business, with an entire new stock of groceries, provisions, hardware, willow-ware, etc. The first year's business was one beset with the difficulties that must attend the efforts of a young man with a small capital in establishing a trade; but since that time, by close application, and strict adherence to business principles, his business has steadily increased, and he now controls a fine trade. Mr. JUSTICE first married Miss Mary CROCKER, of Clinton County, Ill., in 1862. She died in 1874, leaving two children. One, Alice E., is now living. He again married, July 6, 1879, to Miss Mary E. CURLEE, of Greenville, and a native of Bond County. Dr. N. H. JACKSON, surgeon dentist, Greenville, Ill, was born in Warren County, Ky., May 20, 1853. He is a son of C. C. JACKSON, born in 1820, who was a native of Virginia, and by occupation a farmer. C. C. JACKSON was one of the pioneers of Kentucky, in which State he spent most of his life, and there died in 1861, at forty-one years of age. His wife, Sarah JACKSON, nee HENDRICK, was born in 1830, and now of Bowling Green, Ky., is a native of Warren County, that State, and daughter of John R. HENDRICK (deceased), who was a Cumberland Presbyterian clergyman. Dr. JACKSON is the second of a family of five children, four of whom are living. He received his rudimental education at Bristow, Ky., his native home. He after studied the higher branches at Bowling Green, and when but a youth apprenticed himself to an uncle, Dr. J. F. HENDRICK, an eminently successful dentist of Bowling Green, Ky., and under his tuition gained a thorough and practical mastery of the dental profession. September 29, 1878, Dr. JACKSON married Miss Ida A. GRACEY, born September 27, 1861, in Macoupin County, Ill., daughter of W. C. and Sarah J. (McGAHEY) GRACEY. Her father is a well-known farmer of Pleasant Prairie, Bond County. In November, 1880, the Doctor permanently located in Greenville, where he has built up a lucrative and steadily increasing practice. Mr. JACKSON's success is entirely due to his thorough knowledge of his profession and ability to do first-class work. He has commodious rooms in the Coverdale Block. C. H. KOONCE, farmer, P. O. Greenville. The KOONCE family emigrated to the Sucker State in the year 1840. They were natives of the Old Dominion, Jefferson County, near Harper's Ferry, where our subject was born January 31, 1825; son of Nicholas KOONCE, whose birthplace was Loudoun County; son of Henry KOONCE, who was likewise of Virginia birth. The mother of our subject was Elizabeth, a native of Loudoun, daughter of Christopher SCHRIVER, who was a native of Germany. Ten children were born to Nicholas KOONCE, seven sons and three daughters. Nicholas KOONCE was a farmer and mechanic; he worked several years in the arsenal at Harper's Ferry; also in a mill, and turned his attention readily to anything of a mechanical nature. Our subject emigrated West with his parents when he was about fourteen years of age. His father rented land some time east of Greenville, finally located on Section 31, in this township, and remained until his death, which occurred several years prior to the late civil war. His wife still survives him, being nearly ninety years of age. The family born them are a follows: David, Sarah, George, John, Jacob, Christopher H., Elizabeth, Nicholas, Joseph and Mary. But tow are living in this township, C. H. and Elizabeth, wife of J. C. LOVETT. Joseph resides in township adjoining. In October, 1850, our subject married Jane WAIT, of Alexandria, Va., daughter of William WAIT. Mr. KOONCE resides on the farm he entered and improved, consisting of 225 acres; has six children, viz. : Charles, Josiah, Lucy, Angie, George and Hattie. His brother, Nicholas, resides in the south part of the State, a short distance above Cairo. The remaining brothers living are now residents of Virginia, having returned there to spend their remaining life in the land that gave birth to their progenitors. John KINGSBURY, attorney at law, Greenville, was born February 7, 1837, in Hamilton county, Ind. He was the son of Ira and Hannah (FIERCE) KINGSBURY; he was a surveyor and farmer, born in Vermont, and died on his homestead in 1872, October 26. His wife Hannah was born in Hamilton County, Ind. Our subject was their fifth child. He received his education in the common schools of the county, and also attended the Greenville Academy, in 1859-60. In 1873, September 25, at Hagarstown, Ill., he married Sarah J. JAY, who was born in Bond County, Ill. She was the daughter of Joseph A. and Nancy A. (RHEA) JAY. Joseph A. was born December 19, 1826, in North Carolina, and Nancy A., his wife, July 1, 1831, in Tennessee. Subject had a family of four - John M., Mary G., Anna G. C. and Lucy N. Mr. KINGBURY remained at home and worked the farm, supporting his aged father, and when thirty-six years of age began studying law with D. H. KINGSBURY, at Greenville, and was admitted to practice in the courts of this State in 1870, which he continued until he was elected County Surveyor, at which he is now serving his third term. His religion was that of a Baptist, his politics Democratic, and was a member of the A. O. U. W. and I. O. M. A. orders. His father, Ira KINGSBURY, came to Bond County, Ill., in June, 1844, and at the time of his death he owned 320 acres of land. His mother died at Mt. Carmel, Ill., November 28, 1843. William KOCH, Treasurer-elect of the city of Greenville, is a native of Germany, and came to America in the year 1849; landed at New Orleans, sailed up the Mississippi River to St. Louis, thence into Illinois overland to Vandalia, Fayette County, and entered farming about ten miles north of that place. His success as a farmer soon enabled him to purchase a second farm about two and one- [Page 23] half mile northwest of Vandalia. He moved on to the latter purchase, and there remained until 1869, when he sold and removed to Greenville, and entered the lumber trade with Mr. J. C. GERRICHS as his partner. He closed out his interest in 1882, and retired from business. He has the esteem and confidence of his Fellow-citizens, and was elected to the office of Treasurer of the city of Greenville in the spring of that same year. John C. LOVETT, farmer, P. O. Greenville, first saw the light of day August 29, 1825, in Tolland County, Conn.; son of John G. LOVETT, born in the save county and State October 30, 1780, son of James, of English descent, and was a soldier in the Revolutionary war. The mother of our subject was Roxana CHAPMAN. Her father was Hosea, of English descent. The family trace their ancestry back several hundred years. The LOVETT family emigrated to this State in 1837, arriving here in the fall of the same year, and for four years lived in Town 5, Range 3; afterward moved southwest on a farm now owned by Smiley DENNEY. While here he entered the land upon which he afterward settled in 1846, and remained on the same until his death July, 1854. His wife survived him until April, 1863. He was for many years a member of the Congregational Church. He was a strong Whig, and advocated its principles. He had born him the following children: Christiana, Juliana, Orestes H., Delia, John C., Francis M. Of this number but two are living - Orestes, who has resided in Washington Territory since 1849, and John C., who was brought up under the care of his parents, receiving good school advantages, and before coming of age began teaching, which he continued for several years. January, 1853, he married Elizabeth KOONCE, a native of Jefferson County, Va., daughter of Nicholas KOONCE. After marriage, he located on the homestead and since lived there. He has four children - Julia Adelaide, Christiana Louise, Charlotte Alberta, Francis Jacob. Since 1839, he has been a member of the Congregational Church. He has 460 acres of excellent land. James M. McADAMS, County Treasurer, Greenville, was born near Nashville Precinct, son of Samuel G. and Priscilla (SMITH) McADAMS, he born near Nashville, Tenn., December 8, 1813, and was killed December 13, 1864, while arresting deserters in Bond County; she, born in Indiana, and died in 1844; they had five children. Our subject was raised to farming, and followed stock-raising for a number of years; was elected County Treasurer and Assessor in 1879. In 1861, he enlisted in the Twenty-second Illinois Infantry, as a private, and the same year was elected Second Lieutenant; next year promoted to First Lieutenant, and was honorably discharged in 1864. February 16, 1865, he married Miss Fannie SMITH, born in Clark County, Ohio, March 3, 1845, daughter of Samuel SMITH, a native of the eastern shore of Maryland, and two children have blessed the union - Samuel S. and Nellie M. Mr. McADAMS is a Republican, and an enterprising, go-ahead man for the times, and makes a popular and efficient officer. The father of Mr. McADAMS was in the Mexican war, a Captain the Twenty-second Illinois Volunteer Infantry for three years, and afterward Captain in the One Hundred and Thirty-fifth Regiment. His only brother was a member of the Third Illinois Volunteer Cavalry during the rebellion. T. P. MOREY, Circuit Clerk and Recorder of Bond County, was born September 27, 1847, at Mulberry Grove, Bond County; son of Hiram and Eliza J. (BROWN) MOREY; he born in Knox County, Ohio, July 3, 1819, a mechanic and farmer, now retired and liv-[Page 24] ing on his homestead in Mulberry Grove; she, a native of Tennessee, born May 4, 1827, and died August 25, 1875. They had ten children. In addition to the ordinary common school education, our subject attended McKendree College. In 1867, he commenced teaching school, which he continued for six years. In 1876, he was elected to the positions he now so ably fills - Circuit Clerk and Recorder of Bond County. September 27, 1873, at Mulberry Grove, he married Miss Ollie BORROR, born in Franklin County, Ohio, December 26, 1848, daughter of Mr. Isaac BORROR. The people of Bond County have shown their appreciation of a capable and faithful official in retaining Mr. MOREY so many years in the responsible positions he occupies, and when he retires from them, it will be with the regret of his many friends, both inside and outside of his party. George C. McCORD, Greenville, Deputy United States Marshal. Mr. McCORD was born November 15, 1835, at Nashville, Washington Co., Ill. His father, Charles A. McCORD, was a Methodist preacher of Southern Illinois, and was a native of Christian County, Ky. His mother was one Mary PATTERSON, daughter of Joseph PATTERSON, a farmer of the State of Georgia, which was the State of her birth, and she died in 1844, at thirty-six years of age. Charles A. McCORD had eight children; six lived to maturity. He entered the ministry at twenty-two years of age, and continued his ministerial labors until his death, June 24, 1861. He was a second time married to Mrs. Jane LEMON, of Washington County, Ill., and two of his eight children were by his last wife. George C. received his rudimental education in the public schools of Washington County, Ill., and closed his school days with a brief course at the Nashville Academy. He entered farming and stock-raising in Bond County, and made that his business until 1875. October 11, 1862, Mr. McCORD was commissioned Second Lieutenant of Company B, One Hundred and Eleventh Illinois Volunteer Infantry, by Gov. YATES. This regiment served three years in the war. March 2, 1863, he was made a First Lieutenant. In 1867, M. McCORD was appointed Deputy United States Marshal by United States Marshal E. R. ROSE, and was re-appointed in 1880. During his term of office he has made 470 arrests. July 29, 1881, Gov. S. M. CULLOM, having special confidence in his ability, patriotism and valor, appointed him his aid-de-camp, and commissioned him Commander in Chief of the Illinois State troops in the Sixteenth Congressional District, with a rank as Colonel. It is needless to say that Col. McCORD makes a very acceptable and efficient officer. Col. McCORD first married, November 1, 1856, to Miss Altha A. MEANS, daughter of Josiah MEANS, a farmer of Christian County, Ill. She died March 22, 1861, leaving one daughter, Rosa B., now an efficient teacher in the graded schools of Greenville, and one son, Charles R., present, Assistant Surgeon in the Illinois State Prison, at Chester. Mr. McCORD again married, March 8, 1863, to Miss Ella R. DONNELL, youngest daughter of the lamented George DONNELL, one of Bond County's most respected pioneers. They have three children living - Ella, George A. and Emma H. Emily died in infancy. Abe McNEILL, banker, Greenville, is a native of Clinton County, Ill., son of Neilly and Minerva (MILLS) McNEIL, he born in Ireland, and she in Kentucky. They had nine children, seven of whom are now living. Our subject received his education in Bond County, and began life as a farmer and dealer in stock. He has been a resident of Greenville for about fifteen years, in which time he has proven himself to be a thoroughly practical and suc-[Page 25] cessful business man, having been identified with many of the business and public enterprises of Bond County, notably the First National Bank of Greenville, as the President of that institution for several years. In 1853, Mr. McNEILL married Miss Elizabeth ETZLER, daughter of John ETZLER, a native of Virginia, and five children have been born to them - Alice J., Horace M., William A., Mary and Martin. J. B. McADOW, farmer, P. O. Greenville, was born September 22, 1839, in Greenville Precinct, Bond county, Ill.; son of Samuel N. and Jane (PAISLEY) McADOW. His father was born in Tennessee September 10, 1807, and was a pioneer farmer of Bond County, and died in November, 1873; he was twice married; his first wife (Jane PAISLEY) by whom he had nine children, our subject being one, was born at Elm Point, Ill., July 14, 1817, and died September 3, 1844. His second wife, by whom he had five children, was Betsey BREWSTER. Our subject, who is an extensive reader and a well-informed man, received a fair education and adopted the occupation of a farmer. At Alton, Ill., October 6, 1867, he married Miss CLOUGH, born in Alton, Ill., April, 1847, daughter of Samuel and Lucy (BROOKS) CLOUGH. Samuel CLOUGH, who was a carpenter by trade, was born in Portland, Me., in March, 1805, and died in April, 1874. His wife, who is still living, was born in Lowell, Mass., in December, 1809, and is now a resident of Madison County, Ill. Mr. and Mrs. McADOW are the parents of five children - Anna Clay, Lillie Jane, Samuel Guy, Fred Clough and William Henry. Mr McADOW has been a School Director for several years; his brother, William P. McADOW, served in the One Hundred and Thirtieth Illinois Infantry from the autumn of 1862 to the close of the war, participating in the engagements at Vicksburg, and several other important battles during the war. Our subject is a member of the Cumberland Presbyterian, and his wife of the M. E. Church. His father was a Presbyterian minister, and one of the founders of the Cumberland Presbyterian Church in the United States. Mr. McADOW served as a Judge of Bond County about nine years, being first elected to fill the unexpired term of Judge DRAPER, in 1855. Robert MACKAY, farmer, P. O. Greenville, was born February 14, 1829, in Greenville Precinct, Bond County; son of Alexander C. and Mary (CARSON) MACKAY, he a native of Kentucky, who emigrated to Bond in an early day; she a native of Tennessee, who died in 1844, leaving four sons and one daughter. Mr. MACKAY owned 240 acres of land at the time of his death, which occurred July 8, 1856. Our subject, after receiving the education usually accorded to the sons of farmers, began life in the same occupation as his father, at which he has continued throughout life. In November, 1853, he married Miss Margaret SUGG, a native of Bond County, and daughter of Noah A. SUGG, a pioneer, by whom he has had the following children - Mary A., now Mrs. J. T. CORRIE, of Kansas; George; Eleanor J., Emily R., Sarah E., Henry, William, Alvin, Ollie and Walter, all of whom are now living. There is one dead, Mattie, who died at the age of eighteen months. Mr. MACKAY is a Republican. Robert MERRY, Greenville, was born in Kentucky, near the Mammoth Cave, February 8, 1828. He is one of twelve children born to David W. and Isabella (McLONEHON) MERRY. His father, David W., a farmer by occupation, was born in Virginia in 1801; came to Bond County about 1830, and died in 1852. The mother of our subject was born in Kentucky in 1802, and died January, 1871. Robert received his education, which [Page 26] was such as the common schools of the day afforded, in Madison County, Ill. In Bond County, November 18, 1849, he married Mary E. CLOUSE, born in Bond County September 28, 1834, daughter of William and Sallie (SAGS) CLOUSE, the former born in Nashville, Tenn., September, 1818; was a farmer by occupation. During the Black Hawk war, he served as Major, having previously been promoted from the rank of Captain, and died May 20, 1871. The latter, a native of Alabama, died in March, 1838. Mr. and Mrs. MERRY are the parents of six children - Charles W., thirty years; Robert A., twenty-seven years; Sallie C., twenty-five years; James W., twenty-two years; Emily E., nineteen years; and Ella, sixteen years of age. Charles W. is married, and follows the mining business in Colorado; Sallie is now Mrs. C. H. MARTIN, of Greenville, and Emily C. is Mrs. REDFERN, wife of a farmer of Cottonwood Precinct, Bond County. Mr. MERRY was formerly a farmer, but abandoned that business, and removed in the autumn of 1881 to Greenville, where he engaged in the livery business. He has ten good outfits, and is doing a good, paying business. He is one of the prominent men of Bond County. Andrew B. MERRY, farmer, P. O. Greenville, is one of the good farmers of Town 6, Range 3. He was born in Madison County, this State, November 28, 1840, and was brought to this county with his parents when a babe. He was the sixth son of David MERRY, who first settled in Town 6, Range 3, and came to the township about the year 1848, and died in 1853, January 21. Andrew B. was then brought up under the fostering care of his mother, with whom he lived until her death, January 31, 1873. November 27, 1879, he married Keturah NEVINGER, born in Ohio, daughter of Daniel NEVINGER, who came to Bond County in 1878, and located in Town 7, Range 2. Mr. MERRY has but one child, Gertie. He has 169 acres of land, and is a neat and judicious farmer, and successful withal. His farm is located in the northeast quarter of Section 31, in Town 6, Range 3, in Greenville Precinct. McLAIN & Co., millinery and fancy goods, Greenville. The business of this house was first established in 1870, by J. M. MILLER, who conducted it alone until the year 1874, when Mr. William A. McLAIN purchased a one-half interest, and the house then took its present title. In 1875, Mr. MILLER sold his interest to Miss Ella E. HULL. Julia E. LOCKE succeeded to Miss HULL's interest in 1878, and still holds her interest in the business. This house holds a position at the head of the millinery and fancy goods trade of Bond County, and in those lines aim to have their stock always complete and fresh. A stock of books stationery and notions occupy a portion of their salesroom, which is also kept well assorted. They enjoy the confidence of the business and buying public, and have a liberal and steadily increasing patronage. Isaac NORMAN, merchant, Greenville, was born in Parke County, Ind., February 22, 1841, son of Wesley and Elizabeth (McGELVERY) NORMAN, he, a native of Kentucky, born in 1816, a retired farmer now living at Eureka Springs, Ark; she a native of Indiana; they are the parents of five children. Our subject began his business life as a clerk at Martinsville, Ind. ; afterward at Vandalia, Ill., and later at Greenville. In 1864, at Vandalia, Ill., he married Lydia E. WALKER, daughter of Louis WALKER, a jeweler of Vandalia. Four children have been born to them - Louis V., Minnie R., Laverne and Roy T. Is a Methodist, a Mason and a Republican. Mr. NORMAN is a member of the well-[Page 27] known furniture firm of Gerichs & Norman, the representative firm in its lines of Bond County. the business was first organized by Mr. J. C. GERICHS in 1875. Mr. NORMAN has conducted the business for him from that time until 1880, and then took a half-interest in the business. Under his management they have built up a large and growing trade. their stock is always full and complete, and the extended popularity of this firm is largely due to that fact and the inducements they offer their customers in the way of low prices. S. A. PHELPS, lawyer, Greenville, was born June 2, 1817, in Otsego Co., N. Y., son of Joshua and Elizabeth (PICK) PHELPS, of Connecticut, who emigrated to the then far West, Otsego County, N. Y., in 1799. The subject was of a family of nine, being the youngest of his mother's own children. He attended the common school of Otsego County, and afterward entered Union college, Schenectady, N. Y., taking the full course, and graduating in 1838. He first commenced the practice of his profession in Mississippi, at Woodville, in 1839, and continued there until coming to Bond County in 1844. During the first twelve years he farmed near Greenville. In 1841, he married Anna BULKLEY, of New York, and in 1856 came to Greenville and practiced law. His wife died in 1843, and in 1845 he married her sister Caroline. Have two sons - Alfred and George; the former is a lawyer at Denver, Colo.; went out as a private in the 100-days' service in the One Hundred and Thirtieth Illinois Infantry; served three years and returned; the latter was State's Attorney of Bond County; resigned the office, and opened practice in Leadville, Colo. Philo is a Presbyterian minister of Livermore, Cal. ; Charles is in Chicago. The subject was a member of the Presbyterian Church. As a politician he was a Republican. He ran for the Legislature in 1862, and received a majority of 200 in his own county; Madison County turned the majority against him. From 1858 to 1865, he was one of the most active Republicans. During the war he was the one to deliver stump speeches throughout Bond County on the political issues of the day. He is the oldest practicing lawyer in Greenville or Bond County; he has his office over the post office. James PLANT, deceased, was born in Dixon county, Tennessee, on the 9th day of April, 1808, and was a son of Williamson PLANT, a native of North Carolina, and was a tailor by trade, and who married Frances WALTS. They had five sons and five daughters, James being the second youngest. The subject commenced life as a farmer, and received his education chiefly in Pocahontas, having come to this county in 1818. He was married on the 13th day of April, 1837, to Miss Angeline CHAPPELL, a daughter of Robert CHAPPELL, who was a native of North Carolina, and died in Tennessee. Angeline came here with her mother, who had seven children, four of whom are living, Angeline being the second. The subject has three children - Nancy I., now Mrs. D. F. HUNTER; Sarah E. (third child), George F., a farmer of Greenville, who was born October 28, 1845, and married on the 3d day of March, 1872, Miss Orrie A. WHITE, a daughter of Wesley WHITE, one of the oldest settlers in bond County. they have three children - Oscar, Sarah J. and Hattie. The subject was a Methodist; in politics, a Democrat, and owned 160 acres of land. His first wife was Elizabeth WATSON, by whom he had three children. He died on the 22d day of March, 1850. John W. PLANT, farmer, P. O. Greenville, was born in Humphrey county, Tenn, March 12, 1817. He was one of a family of ten born to John and Mary (THOMPSON) PLANT. [Page 28] John was born in South Carolina in 1785; was a farmer by occupation, and died in Tennessee in 1865. Mary, his wife, came to her death by being struck by lightning, in 1830; What little education our subject obtained was in the subscription schools of Tennessee. He learned the molder's trade with his brother, William PLANT, in Tennessee, where at Palmyra, July 30, 1845, he married Ann F. WILLIAMSON, who was born there in 1826. Her parents were Burwell and Evanna WILLIAMSON, of South Carolina. To Mr. and Mrs. J. W. PLANT were born thirteen children, three of whom are dead - Robert, Mary C., Cornelia, Cave J. Samuel W. William A., Perry F. Edward, Margaret A., Laura, Martha, John B and Lizzie. Mr. PLANT followed his trade seventeen or eighteen years, and since then has farmed here twenty-eight years. He is a Methodist, and his political views are with the Republicans. By hard work, economy and industry, Mr. PLANT now owns 662 acres of as good land as can be found in Bond County. Col. John B. REID, retired, Greenville, was born in Ireland August 8, 1830; son of James and Isabella (BARCLAY) REID, who came to America in 1831, bringing a family of eight children, John B. then being only one year old. Alexander REID, the grandfather of our subject, was a soap and tallow chandler in Ireland, and his son James, the father of our subject, learned the business of his father, but abandoned it for music, which he made the profession of his life. When he came to America, he made Nova Scotia his home for several years, and finally, in 1863, died in New Brunswick, his wife dying the year previous. They left six sons and four daughters, John B. being the youngest son. He was educated partly in New Brunswick, and partly in New York, and afterward learned the shoemakers trade, in which he continued until 1860, having come to Greenville from Boston in 1854. From 1856 to 1861, he was Postmaster at Greenville, and was Clerk of the Circuit Court from 1860 to 1868. In 1862, he enlisted in the One Hundred and Thirtieth Illinois Volunteer Infantry, and was elected Captain, but was commissioned as Major on the organization of the regiment; was afterward promoted to Lieutenant Colonel, and later, Colonel. While in the army, he was elected to the Clerkship of the Circuit Court, and the Government being appealed to, it was decided that he could hold the civil as well as the military office at the same time. He served about three years, having been wounded in the shoulder by a Minie-ball, and was taken prisoner and confined for a couple of months, when he was paroled. His wife was Miss Emma T. HOLDEN, of Woburn, Mass. ; has five sons and five daughters; two oldest sons married and in business. Col. REID is a member of the Baptist Church, being a Deacon in the same; is Master of Masonic Lodge, No. 245; is an Odd Fellow, an A. O. U. W., a temperance man and a Democrat. ROBINSON & REID, general loan and insurance agents. This enterprising business firm, composed of William E. ROBINSON and J. Ward REID, is one of the most wide-awake and prosperous in its line in Bond County. In one sense, this copartnership may be said to have existed longer than any other in Bond county, as Will and Ward were both born in the same neighborhood, and in youth attended the same school. In 1876, they graduated at the Greenville High School, under Prof. INGLIS. Mr. ROBINSON then taught school one year, and Mr. REID entered upon a course of study at the Illinois State University, at Champaign, and his schoolmate naturally enough came the next year. They each spent two years at Champaign, during [Page 29] which time the possibilities of a bright and prosperous business future became a favorite topic for conversation and discussion between them, which talk finally led to the abandonment of their studies. Mr. ROBINSON entered the Circuit Clerk's office, at Greenville, and during his nineteen months' connection with that office, he made a business trip to Colorado. During this time Mr. REID clerked in H. T. POWELL's drug store, Greenville. In the fall of 1880, they entered an abstract and insurance office at Mt. Vernon, Ill., where they obtained practical ideas of their business. They formed their copartnership September, 1881, and Mr. REID immediately commenced work upon a set of abstract books, which are now the most complete in the county and in fact the only ones, since all others are but indexes of the county records. Much time and labor have been bestowed upon these books, and ROBINSON & REID have now the only complete set of abstract books in Bond County. these valuable records enable this firm to furnish to applicants abstracts of titles on much shorter notice and in less time than any others. They are also making a specialty of fire and tornado insurance, and represent the Liverpool, London, and Globe; Continental, of New York, American, of Newark, N. J., the German, of Freeport, Ill., California, of San Francisco, and the Manhattan, of New York. The first mentioned is the largest fire insurance company in the world, and the others are equally safe, and each has its desirable features for the insurance of different classes of property. Mr. ROBINSON returned to Greenville in December, having, during the past summer, written up a complete set of abstracts of the records of Platte County, Neb. Since that time this young and enterprising firm have been building up a business which shows the confidence the people have in them as men of business and reliability. John RIEDLINGER, saloon keeper, Greenville, was born in Highland, Ill., March 11, 1854; son of Martin and Margaret (RUDE) RIEDLINGER. He was a shoemaker by trade and died in 1873; his wife is still living. They were the parents of four boys and four girls. Our subject learned the tinner's trade with Mr. Theodore RUGER, in Highland, and afterward tended bar for Mr. SCHOTTE, in Greenville. In Greenville, April 28, 1875, he married Miss Mary Ellen HUESSEY, born October 7, 1854, daughter of Jacob and Annie HUESSEY, and three children have been born to them - Louis F., Lela M. and Ida A. Is a German Protestant, a member of the Mutual Aid Association, and a Republican. The father of Mr. RIEDLINGER removed from Germany, his fatherland, to Switzerland, and from there came to America, his wife accompanying him in his travels. He was a man much respected in his own country as well as this. John J. SMITH, deceased, was born in Harrison County, Ind., April 10, 1813; son of James and Sarah (LONG) SMITH, he a native of Virginia, a farmer, shoemaker and blacksmith; she, a native of Kentucky. They had ten children, John J. being the eldest. The father of James, and great- grandfather of the seven sons of John J., was Edwin SMITH, one of three brothers who came to America during the Revolution, as British soldiers, but Edwin's heart not being in that unjust struggle against the weak but determined colonies, he left the army of England and settled in Virginia, afterward removing to Kentucky, where he died. John J., our subject, only received a common school education, but was a well-informed man. He followed farming all his life, and was a man [Page 30] highly respected for his many qualities of mind and heart. He left each of his sons 200 acres of land, and such was his systematic methods of doing business that it cost only $225 to settle his estate. He was fifty-seven years of age when he joined the Baptist Church of Smith Grove (named for him). He was a Democrat in his political views, but always conservative in sentiment. July 15, 1840, he married Eliza HUBBARD, born in Tennessee June 30, 1822, daughter of Philip and Emily (SMITHWICK) HUBBARD, he a Bond County pioneer, and she a native of North Carolina, and eight sons were born to Mr. SMITH, one of whom, David D., died from the bite of a snake in 1854; the other seven are all residing in this county, and a short sketch of each one we give as follows: Cyrus J. SMITH, farmer, P. O. Greenville, was born January 17, 1842; is a thorough-going farmer, and has 287 acres of land, all well improved. He is a Democrat. He has been married twice; first, June 16, 1867, to Miss Catharine WATSON, daughter of James WATSON, a native of Tennessee. She died December 17, 1876, leaving one daughter, Annie. August 2, 1877, he married Hannah ORME, daughter of Thomas ORME, a resident of this State up to the time of his death, November 10, 1879, he being a native of England, and emigrating to this country in 1838; was a shoemaker and farmer, and had four children, Mrs. SMITH being the youngest. The others are John T., Walter L. and Lawrence E. Mrs. SMITH's mother was Ann HAWKSWORTH, of English birth. Newton T. SMITH, a farmer, was born April 20, 1843. September 14, 1864, he married in Beaver Creek Precinct, Emeline CASTLE, who was born in Ohio February 27, 1841, daughter of John T. CASTLE, a farmer, and native of the State of Ohio, who came to Bond County about 1845. Mrs. SMITH was the oldest child. Mr. SMITH is an enterprising farmer, and owns 227 acres of excellent land, on Section 28, Township 4, Range 5, and twenty-three acres on another section. He is a Democrat; he has seven children - William N., Arthur D., Robert M., Rhoda L., Lois L., Emeline and Lillie M. James M. SMITH, farmer, was born December 25, 1844, and was, like his brothers, raised to a life of farming. He was married May 1, 1870, to Miss Martha CASTLE, daughter of John CASTLE, and they have one child, Grace, born in November, 1878. J. Frank SMITH, farmer, was born September 26, 1854, on the old Smith homestead, in Greenville. He has 195 acres of good land, which came to him from his father's estate. February 10, 1876, he married Ellen McCALL, a native of Bond County, born March 28, 1856, daughter of Frank Mccall and Mary (McCASLIN) McCULLEY, he a native of Tennessee. Mr. SMITH has three children - Mollie, Dora and Harry. Is a Democrat. Charles C. SMITH, farmer, was born in Greenville Precinct, on the old homestead, March 28, 1857, and was married March 10, 1878, to Miss Anna M. GOAD, born April 16, 1860, daughter of William and Amanda (ALLEN) GOAD. Mr. GOAD has been a resident of Bond County for about seven years, and has three children, Mrs. SMITH being the oldest. One child has been born to Mr. SMITH, Pearl, born December 6, 1879. He owns 210 acres of good land, and is a Democrat. Phillip SMITH, at home on the homestead, was born December 8, 1858, and married Miss Frances HUNTER March 12, 1882.Peter L. SMITH, was born December 12, 1859; is unmarried, and lives on the homestead with his mother, he being, like his six brothers, a farmer. H. H. SMITH, trader, railroad agent and [Page 31] Postmaster of Smithboro, Greenville Precinct, is the founder and chief proprietor of Henderson, which is situated four miles east of Greenville, on the Vandalia & Terra Haute Railroad. The subject of these lines was born in Clark County, Ohio, Feb. 19, 1833; son of Samuel SMITH, a Marylander, son of William, who emigrated with his family and settled in Clark County, Ohio, when it was a wilderness. The mother of our subject was Anna, daughter of Philip HEDRICK, who was likewise an early settler in Clark County, Ohio. Hiram H. had good common school advantages, completing the same at Delaware, Ohio; came to Illinois in 1854, to Greenville; his father came three years later. When Mr. SMITH came to the county, he purchased 800 acres in Town 5, Range 2, and engaged in farming and stock-raising; came to this place in 1870, and with the exception of two years spent in Greenville, he has been a resident of this township, and has done much toward encouraging the growth and improvement of the township, and founded the town soon after he came here, and since 1871 has been Postmaster, the office being named in honor of him. He is also railroad agent here, and does a general trading business, and is a thorough- going and energetic business man. In 1868, he was married to Eleanor C. CULVER, born in Herkimer County, N. Y., daughter of Andrew CULVER. Mr. SMITH has no children; has about five hundred acres of land; is a member of the M. E. Church, and a strong and uncompromising temperance man. William S. SMITH, merchant and banker, Greenville, was born in Hampshire (now Morgan) County, Va., ; son of Middleton and Leah (WILLIAMS) SMITH, both natives of Virginia, he a farmer by occupation, born in Frederick County December 27, 1786, died in Greenville, Bond Co., Ill., July 29, 1849; she born in Hampshire (now Morgan) County December 30, 1784, also died in Greenville December 22, 1845. She was the mother of nine children - William S., Thomas W., John A., Isaac M., Samuel, Jane M., now wife of John S. HALL, a farmer near Greenville, Ill.; Mary A., Ellen and Joshua M. Subject began the business of life at fourteen years of age as a clerk in a mercantile house, and has since been engaged in mercantile business and banking. At the age of Twenty-three, he removed from Virginia and located in Greenville, in which place he has ever since resided. He is one of the founders of the First National Bank of Greenville, of which he was President for several years, and at the present time a Director; has filled the offices of School Commissioner and County Assessor, and is at the present time City Alderman of the Third Ward, Greenville. During the years 1846-47, he was Representative in the Legislature. He has been twice married. His first wife, whom he married near Greenville, was Amanda M. HALL, second daughter of Joshua and Charlotte HALL, of Jefferson County, Va. She died January 21, 1849, leaving seven children - Tiffin A., Sarah V., William S., Jr., Charlotte L., Ellen E., Mary H. and Joshua S. He was married the second time at Stony Point, Crittenden Co., Ky., to Elizabeth W. GREATHOUSE, daughter of John S. GREATHOUSE, attorney at low, of Shelbyville, Shelby co., Ky., who married Lucy M. CLARK of Anderson County, Ky. From this second union six children have been born - Edgar T., Lucy E., Alice G., Elizabeth L., Lucien G. and Clark S. Mr. SMITH was an old-time Whig, is now a Republican, and is a member of the I. O. O. F.
Dr. R. C. SPRAGUE, physician and surgeon, Greenville, was born in Washington County, Ohio, on the 10th day of June, 1828, and is a son of Anson SPRAGUE, a native of Massachusetts, who was born October 3, 1781, and [Page 32] died July 9, 1856. His mother, Susannah SPRAGUE, a native of Fort Waterford (first garrison in Ohio), was born April 2, 1793, and died December 9, 1857. They were married in Washington County, Ohio, in 1806. The subject's father was a farmer, and held the office of Justice of the Peace for several years, and moved to Franklin County, Ohio, in 1832. The family were long and well known as active and zealous members of the Christian Church. They had nine children, five sons and four daughters. Dr. SPRAGUE's first schooling was in the district schools of Franklin County, Ohio, near Columbus; afterward he attended the academy at Reynoldsburg, in the same county. He commenced his college career at the Eclectic Medical Institute, Cincinnati, Ohio, where he graduated in 1857. He also took a course in the Eclectic Medical College of New York City, in 1866. He came to Greenville with a brother, Dr. Anson SPRAGUE, in 1852. In 1854, at Vandalia, Ill., July 6, Dr. SPRAGUE married Miss Martha J. JOHNSON, daughter of Duncan JOHNSON, who was born in Tennessee January 11, 1803, and died December 12, 1867. Polly JOHNSTON, nee POWERS, Mrs. SPRAGUE's mother, was born in Tennessee August 5, 1807, and died January 22, 1852. They were married May 27, 1824, and moved from Tennessee soon after, locating in this county. Mr. JOHNSON was a farmer, and held the office of Justice of the Peace for many years. He was prominently connected with the milling interest of this and Fayette County, and was a zealous worker in the Methodist Church, all his family belonging to the same denomination. Dr. SPRAGUE has been a member of the City Council for many years, and is the father of seven children, four living - Clara Ellen, now Mrs. JOHN, of Greenville; Sarah Maud, now Mrs. W. H. McINTYRE, of Rushville; Romulus D. and Ruby B., now in school. The children deceased are Mary Irene, Beverly J. and Hattie Mabel. The Doctor is a member of the Christian Church, an A. O. U. W., and a Republican. William B. SYBERT, farmer, P. O. Greenville, was born in Ohio February 13, 1822; son of Henry and Sarah SYBERT, both of whom are dead, he departing this life in 1864, and she in 1866. He was a farmer by occupation, and left eleven children, seven girls and four boys. Our subject attended school in Madison County, Ind., and commenced the life of a farmer in Greenville Precinct, in which occupation he has continued, owning at the present time 227 acres of the best land in the State, and being highly respected as a farmer and a man. He has filled the position of School Director, and is a Methodist and a Republican. October 3, 1844, in Greenville Precinct, he married Miss Malinda E. EDWARDS, daughter of John EDWARDS, and seven children have been born to them - James F., John H., Harriet M., Lemuel, Albert, Morgan L. and Betsey E. Reinhold SUESSENBACH, farmer, P. O. Greenville, was born in Prussia March 19, 1838. He was the son of Christian Wilhelm and Renate (TAESLER) SUESSENBACH, both dying in Germany, he in 1859, and she in 1840. Our subject was one of a family of three. He was educated in Prussia, where the law requires them to attend school for eight years. In Bond County, in June, 1875, he married Mary SCHMOLLINGER, daughter of Christopf and Frederika SCHMOLLINGER. Subject had a family of three - Amanda Bertha, Conrad Gustav and Heinrich Oscar. In German, he learned the brick and stone-mason and plasterer's trade, and has worked at it a good deal, but is farming at present. He is a Republican. D. D. THOMSON, farmer, P. O. Greenville, Greenville Precinct. Among the enter-[Page 33] prising farmers in this township is Mr. THOMSON, who was born October 2, 1846, in Hendricks County, Ind. He is a son of John R. THOMSON, a Kentuckian by birth, and emigrated to Indiana about the year 1842. He was a farmer and stock-trader, and was prominently identified with that country as a business man. He died August 5, 1862. He was a member of the Presbyterian Church. His wife survives him. Nine children were born to them; seven are now living. Their names are as follows - Nelson C., David D., Sarah E., Samuel E., Arthur R., Ollie D., John R. and Ella D. All reside in Indiana except David D., who was raised a farmer, and remained with his father until he became of age. September 26, 1867, he married Lavinia S. HENDRIX, born in Hendricks County, Ind., daughter of Jesse HENDRIX, of that place. In the fall of 1871, he came to this county, and after buying and locating on several different farms in the county, March 31, 1881, he purchased the Samuel COLCORD farm, comprising 272 acres, where he now resides. He has four children living - Amos D., Cordia N., Bertha and an infant unnamed. Mr. THOMSON is a member of the German Baptist Church. Capt. S. M. TABOR, livery, Greenville, was born in Madison County, Ill., October 29, 1833, son of Isham and Phoebe (ADAMS) TABOR, he a native of Tennessee, a farmer, who died about 1837; she also of Tennessee, dying in 1841. They were the parents of five children, four sons and one daughter, Capt. S. M. being the third in order of birth. After receiving an ordinary education, young TABOR began his business life as a farmer; but in 1877, he entered the livery business in Greenville. In 1862, November 20, he married Miss Sarah A. JETT, daughter of Daniel JETT, a pioneer of Bond County, and six children have been born to them - Lizzie, May, Flora, Hattie and Josie; Edwin, an only son, died in 1874, aged one year. Capt. TABOR was Deputy Sheriff of Bond County from 1868 to 1878, and has held the office of Constable for about thirteen years. and his present term will not expire until 1885. In 1861, he entered the service of his country as a private in the Third Illinois Calvary; was promoted to a Second Lieutenancy in 1864, and to Captain in 1865, giving four of the best years of his life in battling for the preservation of the Union - a record to look back upon with feelings of genuine pride. He was in thirty-two engagements, and being slightly wounded three times. Self and family are members of the Christian Church, and he is an I. O. O. F., A. O. U. W., a Good Templar and a Republican. Hon. William S. WAIT, deceased. The subject of this sketch was born in Portland, Me., March 5, 1789, and was the second of a family of nine children, three of whom died in childhood, and six living an advanced age. Of his ancestors we have no extended record. His father, Thomas Baker WAIT, born August 4, 1762, was of Welsh descent, an only child, and by occupation a printer, publisher and book-seller. He was a man of firm character, and delighted in literary pursuits. The mother, whose maiden name was Elizabeth SMITH, was born October 25, 1760, and was loved and blessed by all who knew her, and died January 1, 1845. William S. received his rudimental schooling in the public schools of his native town, and when a youth entered the book publishing house of his father, continuing with him, who was at times associated with others in the business, until over thirty years of age. their business was at different times conducted in Portland, Me., and Boston, Mass., and extended over all parts of the Easter, Middle and Southern States. When a mere boy, William S. and a brother two [Page 34] years older for a time did all of the labor, mechanical, editorial, and otherwise necessary to publish a weekly newspaper. In June, 1817, he started on a journey to the west, through the States of New York, Pennsylvania, Maryland, Ohio, Indiana, Illinois, and Missouri. This he accomplished, arriving at St. Louis, Mo., January 3, 1818. He returned into Illinois, reaching Old Ripley, Bond County, February 14, following. There he made his first land entry February 17. He started on his tedious return in the month of April, and reached Boston July 11, 1818, having traveled more than five thousand eight hundred miles, mostly in the saddle. With the keen foresight of an old time pioneer, Mr. WAIT made note of the wonderful advantages that the Great West afforded the man of energy and nerve. June 27, 1819, he started out on a second prolonged business trip in the interests of his house, to Virginia, viz. New York City, Philadelphia and Washington, making a canvass of the last-named State for some of their publications, riding about six thousand miles, and returning to Boston in April, 1820. In May, 1820, he married Sarah NEWHALL, of Salem, Mass. She was born January 31, 1797, and was the sixth child of a family of eight. Her parents, Thomas and Mehitable (CHEEVER) NEWHALL, were born 1754 and 1762, and died January 1, 1832 and January 12, 1830, respectively. They were both natives of Massachusetts, and have extensive family relations. Of their children none but Sarah ever married. Soon after their marriage they started on his second trip to Illinois. The journey was a tedious one, and attended with the perils of a long drive with horses and light wagon through a dense, unbroken wilderness. It was, however, safely accomplished, and the bride and groom arrived at Old Ripley late in the summer of 1820, and immediately began farming. In 1821, he became interested in a mill. He lived at Ripley until the summer of 1824, when he returned East with his wife and child, on a visit to their parents. Mr. WAIT's previous business relations had given him a thorough knowledge of the country and an extended acquaintance with its people, which in future years were of much avail to him in his business. The winter of 1824-5 was spent in traveling for a publishing house through the Middle States and Illinois, and early in April, 1825, he was for a third time at Old Ripley, his wife and two children joining him in the following November. They returned to Boston, Mass., in February, 1827, however, and until the spring of 1835, he was there actively engaged in publishing, when he again returned to Illinois, and made a permanent stay, settled near Greenville, engaged extensively in farming. A prominent feature of Mr. WAIT's enterprise as a farmer was the planting of one of the largest apple orchards in Illinois. William S. WAIT was always foremost in any local undertaking that was calculated to advance the interests of the community, and was ever ready with his pen or good words to assist in State or National enterprises. His readiness and ability as a local statesman had won for him the personal acquaintance and esteem of all of the Illinois Governors from 1818 to 1865, and with many he was on intimate terms. He was known as a man who could not be bought and sold, was never backward to form and express plainly his views on any important subject. With political tricksters and wire-pullers, he was not a special favorite. He was not an office-seeker, and had no bargains to drive - allowed them to go their own way. October 14, 18435, he presided as Chairman of the National Industrial Convention at New York, on which occasion he delivered an able address. June, 1848, the Industrial [Page 35] Congress, held at Philadelphia, representing the various National Reform Associations of the United States, nominated Gerrit SMITH as their candidate for President of the United States, and William S. WAIT for Vice President, which candidacy Mr. WAIT respectfully declined. To make mention of the numerous conventions and meetings, political, agricultural, railroad, etc., in which Mr. WAIT took a prominent part, would necessitate the addition of an extra chapter. We will further state, however, that he took a deep interest in the formation of the laws of Illinois, wrote many letters and newspaper articles regarding them. May articles or parts of the Constitution of 1878 were from his pen, as also the first drafts of many of the acts of the Illinois State Legislature. He took prominent parts in County and State Agricultural Societies; was the prime mover in the projection of the Mississippi & Atlantic (now Vandalia line) Railroad and in its interest spent a great part of his time from 1846 to 1865. (See history of Vandalia Line and general history of the county in this volume.) He was also one of the incorporators of the St. Louis & Illinois Bridge Company. Mr. WAIT always kept well-informed on all matters of improvement, whether pertaining to county, State or Nation. He was an investigator of all new subjects, a close student, and a clear and voluminous writer on political, educational, agricultural and reformatory subjects, a constant correspondent with many of the best minds of the age, and a frequent contributor to the press. He died July 17, 1865, and she who had been his faithful helpmeet and loving wife for more than forty-five years, departed the following 14th day of September. Of their eight children, two died in infancy; one when just budding into womanhood. One is a resident of Tulare County, Cal., and four are residents of Bond. T. B. WOOD, harness and saddlery, Greenville, for several years a thriving citizen and business man of Greenville, was born in Highland County, Ohio, August 9, 1838. His father, Thomas J. WOOD, also a native of the Buckeye State, was a hatter by trade, which he followed until after middle life, and then entered the retail grocery business. He took for his wife one Evelyn HARDY, a native of Massachusetts. Or subject received in youth only the advantages of a common school education in the rural districts of Highland County, Ohio, and at about fifteen years of age learned the harness-maker's trade at Mr. Sterling, Ohio. After remaining in Mr. Sterling two years, he went to Washington, Fayette Con., Ohio, for about the same length of time, and came to Greenville, Bond County. In the spring of 1861, he entered the Twenty-second Illinois Infantry, taking up arms in defense of the Union. After six months' service, he was discharged on account of disability. Returning to Greenville, he re-enlisted in the One Hundred and Thirtieth Illinois Infantry, after a respite of about six months. He remained in the service until the close of the war, having served about three years. He was at the battle of Vicksburg, also in the heat of the battle of Mansfield, where he received a severe wound, and was captured by the enemy. After confinement in a hospital for about three months, he was paroled, and later exchanged, and closed his term of service on the Gulf of Mexico. In 1865, he returned to Greenville, entered his present business, in which he has been successful. He manufactures everything in the harness line, and carries in his stock a complete stock of saddles, etc. His store is located on the east side of the public square, where he can always be found ready to meet his customers. Edwin B. WISE, merchant, Greenville, was born in Hebron, N. H., December 22, [Page 36] 1836. He was one of twelve children born to David and Elizabeth (HOYT) WISE; he, a native of New Hampshire, a farmer by occupation; came to Illinois in October, 1854, with his family. He died May 30, 1864. His wife was one of twelve children born to David and Elizabeth (HOYT) WISE; he, a native of New Hampshire, a farmer by occupation; came to Illinois in October, 1854, with his family. He died May 30, 1864. His wife was the daughter of Abram HOYT, a native of New Hampshire, and a pioneer of this State. Our subject received a common school education in New Hampshire, and at Greenville. Mr. WISE was twice married; first, on February 7, 1862, to Lestina D. CORBIN, daughter of Ephraim CORBIN, who was a native of England, and by occupation a lumber merchant of Hannibal, Mo. She died April 20, 1871, leaving three children - Alonzo D., John L. and Katie, the latter having died; second, August 24, 1871, he married Kate M. MILLER, daughter of George MILLER, of Clinton County, Ill., a carpenter by occupation, and a native of Perry County, Penn. She is the mother of two children - Ernest and an infant now deceased. Mr. WISE was in the mercantile business at Wisetown, Beaver Creek Precinct, Bond County, a thriving little trading post, which he established himself, remaining there until February 1, 1882, when he purchased one half interest in the stock and business of the well- known New York clothing house of Lewis KAUFMAN, and the Connection of Mr. WISE with this establishment is a sufficient guarantee to the buying public that the New York clothing house has become a safe and profitable place to exchange money for merchandise. Mr. WISE enlisted in Company C, Twenty-sixth Illinois Infantry as Sergeant August 19, 1861, and was at the siege of Corinth, Miss., in 1862, and in the battle at Farmington. He was promoted to Second Lieutenant, and afterward discharged on account of disability. In politics, he is a Republican; is a member of the A., F. & A. M. and A. O. U. W. Mr. WISE is a very successful merchant, and is highly esteemed. William H. WATSON, grocer, Greenville, was born in Newport, Bond County, July 31, 1849; son of Andrew W. and Cynthia A. (DIAMOND) WATSON, he born in Cleveland County, N. C., in 1812, and died June 6, 1881. He was a farmer and merchant, and came to Bond county in 1820, locating in Zion Precinct. He merchandised for twenty years in the town of Newport. His wife was a native of Tennessee, and died in 1856, leaving four children. In 1858, he married Cornelia J. DANIELS, and by her had seven children, five of whom are living. Andrew W. WATSON served one year in the Black Hawk war. Our subject attended the schools in Newport, and was raised on his father's farm, and worked in his father's store. May 1, 1880, he married, in Greenville, Louisa A. JETT, daughter of Mr. Gabriel JETT, a pioneer of Bond, who died in 1860. Mr. WATSON is of the firm of Watson & Jett, grocers, who commenced business together in 1880. They carry a fine stock of goods, and do an extensive trade; also, a general produce and exchange business. Mr. WATSON is an Odd Fellow and a Republican. Thomas WAFER, miller, Greenville, was born about twelve miles northwest of Greenville, in Cottonwood Grove Precinct, and is a son of the late James and Sarah (ELDER) WAFER, he born on Bullock Creek, within seven or eight miles of King's Mountain, District of York, in the State of South Carolina, on the 28th day of February, 1873, at his home in bond County, where he had resided for fifty-three years; she, born in Livingston (now Crittenden) County, Ky., May 22, 1795, died July 11, 1847. The subject's grandfather, named Francis, was born in [Page 37] South Carolina about 1750, and died in Kentucky in the year 1823, and his great-grandfather, also named Francis WAFER, was born in Ireland about the year 1706. The parents of the subject had eight children, and he began life as a farmer, and married at the residence of the bride's parents Mary Agnes Davidson McLAIN, daughter of John A. McLAIN, who was born in bedford County, Tenn., June 17, 1826. the subject is a member of the well-known firm of Plant & Wafer, millers. He has one son, Charles Louis, and one daughter, Orrey E., who married Robert THACKER. In religion, Mr. WAFER is a Presbyterian, and in politics a Republican. He is one of the earliest pioneers of Bond County, and one of its most substantial citizens. John B. WHITE, deceased, was a farmer and one of the early settlers of Bond County. He was born in Rutherford County, N. C., January 20, 1790; son of Thomas WHITE, a school teacher, who is said to have taught the first school in Bond County, near Greenville. He was of North Carolina birth, and his wife, a Miss TORRENCE, was also of the same State. They had two daughters and five sons, John B., our subject, being the oldest, who died June 28, 1873; his wife preceded him February 18, 1848. Eleazer H. WHITE, son of the above, was born in Bond County October 6, 1835; is a farmer by occupation. February 22, 1863, he married Miss Harriet A. GOODSEN, by whom he has four children - Ida E., John B., Hattie A. and George W. Is a Presbyterian and a Republican. S. W. WHITE, is another son of John B. WHITE, and was also born in Bond County; is, and has always been, a farmer. In April, 1857, he married Miss Martha GOODSEN, and has three children - William T., Maggie E. and Fannie M. He is a Republican. Sprague WHITE, Justice of the Peace, Greenville, was born February 19, 1813, at Greenville, Bond Col, Ill. He was the son of James WHITE, who was the third child of Thomas WHITE, and the only child now living, and Mary (DENNY) WHITE, daughter of James DENNY, a pioneer of Bond County, Ill. Subject was one of a family of seven, four of whom are still living. He was educated in Bond County, having attended the academy at Greenville. In 1877, he married Virginia A. CORRIE, daughter of Joseph CORRIE, a farmer an old settler of Bon County. Subject had one son - Roy Sprague WHITE. Our subject began teaching school when but a youth. He taught about twenty years in Jersey County, Ill.; then, in 1875, he taught in Texas, and has since been a resident of Greenville, where, in the fall of 1881, he was elected Justice of the Peace. Mr. Sprague WHITE is regarded as one of the best informed men on general topics, having devoted his entire life to reading and studying of a general character. He is an Old-School Presbyterian and a Whig-Republican. His grandfather was the son of John WHITE, who was of English and Irish descent, and emigrated to this country about 1740. David WILKINS, physician and surgeon, Greenville, was surgeon, Greenville, was born March 28, 1829, in Merom, Sullivan Co., Ind. ; son of David W. and Frances (BALTHAS) WILKINS. David W. was born in Virginia in 1778; removed to Indiana about the year 1820, and died in 1848. His wife, also a native of Virginia, was born in 1782, and died in 1847. Our subject, the youngest of a family of five sons and five daughters, attended school in Sullivan County, Ind., and, having chosen the medical profession, took his course in the Medical Department of Michigan University, graduating in 1853. He began the practice of his profession in Mulberry Grove, Bond Co., Ill., and removed to Greenville in the [Page 38] autumn of 1859. At Medarysville, Ind., May 29, 1853, he married Maria M. GWINN, born in Michigan City, Ind., May 27, 1836, daughter of Andrew and Mary Ann (FULTZ) GWINN. Andrew GWINN was a native of Londonderry, Ireland; was born in 1788, and died in 1848. His wife was born in Baltimore, Md., in 1804, and died in 1863. Mrs. WILKINS bore her husband four children - David R., Lillian G., Corwin and Harry E. Our subject entered the One Hundred and Thirtieth Illinois Volunteer Infantry as Surgeon in 1862, and was discharged in 1865. He is a skillful physician, and has a large practice. In politics, he is a Republican, and formerly belonged to the old Whig party. Mrs. WILKINS is a member of the Baptist Church. Extracted by Norma Hass from the History of Bond and Montgomery Counties Illinois, published in 1882, Part II Biographical Department, pages 5-38.